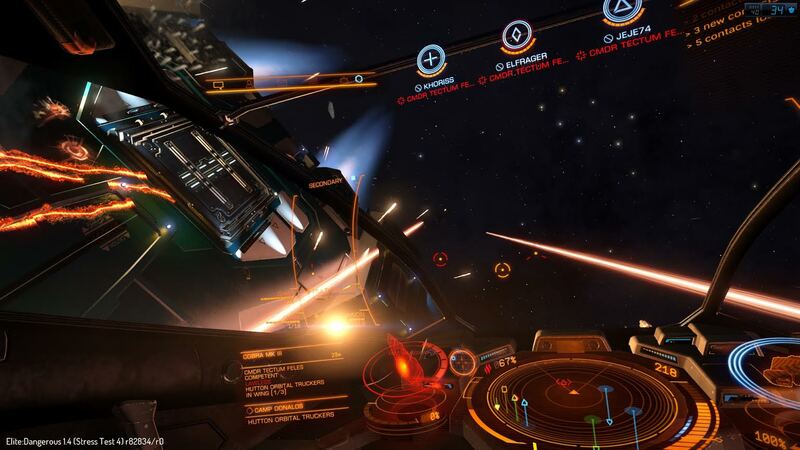 This role will require some “Skill” to master: the Elite: Dangerous – Fighter. Vanquish your enemies, steal their goods or rather protect your allies? This guide is for you. First of all, note that the tips that will follow are my own ways to play. As a fighter, your roles can be multiple and your intentions different. Are you a mercenary making contracts in conflict / war zones or hunting bounties? An assassin looking for a dangerous fugitive? A guard, protecting traders? A pirate stealing from the weakest? A veteran fighter for your Powerplay Power? You have to know that everything is possible. 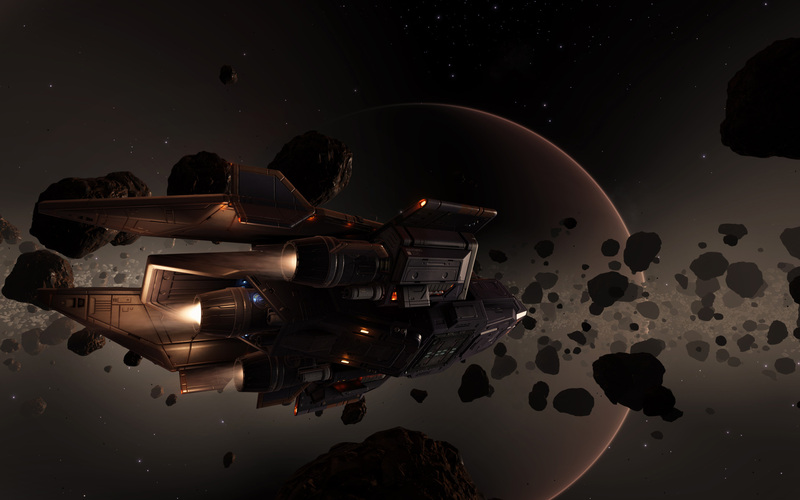 There are no key builds: only your ship’s abilities, your pilot skills and your way of playing the game. Quick attack, try not to be hit. This gameplay is difficult and requires a suitable vessel generating little heat. 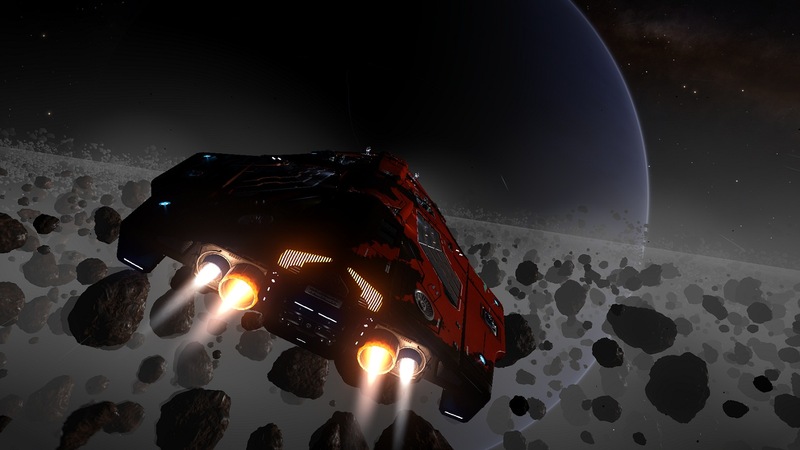 Ex: Diamondback Scout or Eagle MkII. Primarily for Bounty hunting and easy targets, generally used in PvP. A technique based on shields and a self-sufficiency in combat. No need to land for ammo between battles. Ex: Python or a Vulture. Mainly for Powerplay or conflict zones. You’re so tough your opponent might abandon: that’s a win. Hull/modules reinforcements and a Repairing module are really important here. 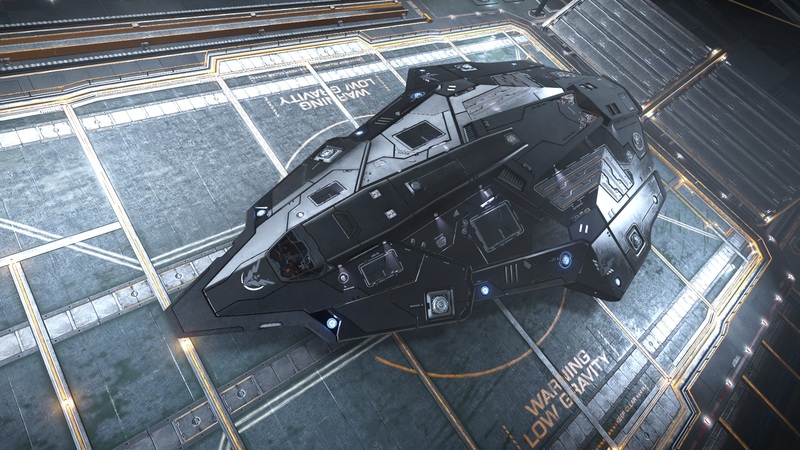 Ex: Federal Gunship or an Anaconda. Mainly for long battles like the conflict zones. A balanced and versatile technique. Ex: Viper or Imperial Courier. Mainly for bounty hunting and assassinations. Pirates: They mainly attack the traders ships to steal their commodities and sell them to the black markets. You have to be precise to quickly recover the commodities before the police arrive. To do this, you have to attack the target’s cargo hold with your weapons or cargo hatch breaker limpets … or simply demand your target some of their resources. Mercenaries: They perform combat missions to help the factions, for example in conflict zones. Mercenaries can be loyal to a faction or perform all the missions, regardless of factions. Assassins: They hunt down and destroy dangerous fugitives (alone or in squads) to claim their bounties. This can be considered as a mix of mercenaries and bounty hunters. More risks, more rewards. Bounty Hunters: No missions for these roles, players go directly into space, beacons, resource extraction sites, … in short all the places where possible targets could be found. They scan their targets from afar before destroying them in order to claim the bounties. Guardians: What I call Guardians are the representatives of Powers. 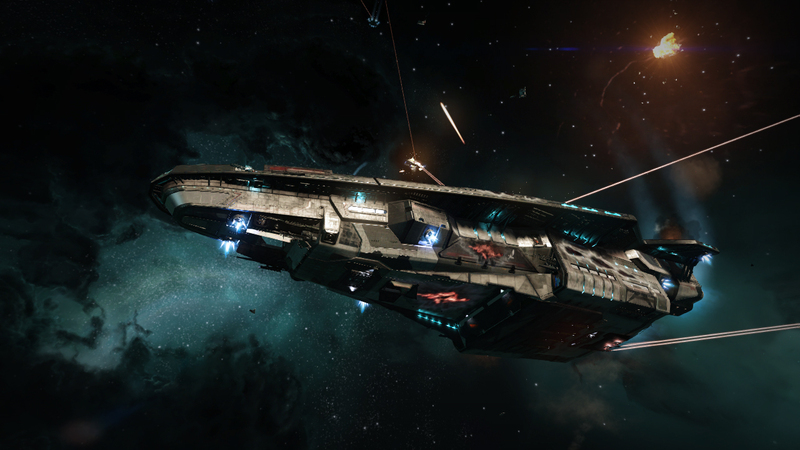 They play in Powerplay and must outfit their ships to fight over a long period. They can protect their systems of jump far to attack other Powers. 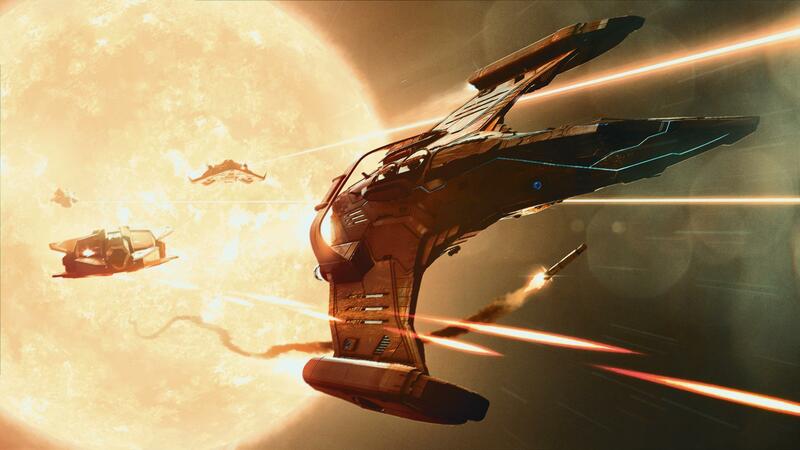 Any ship can fight and fulfill all the fighters roles… but some are more advantaged than others. 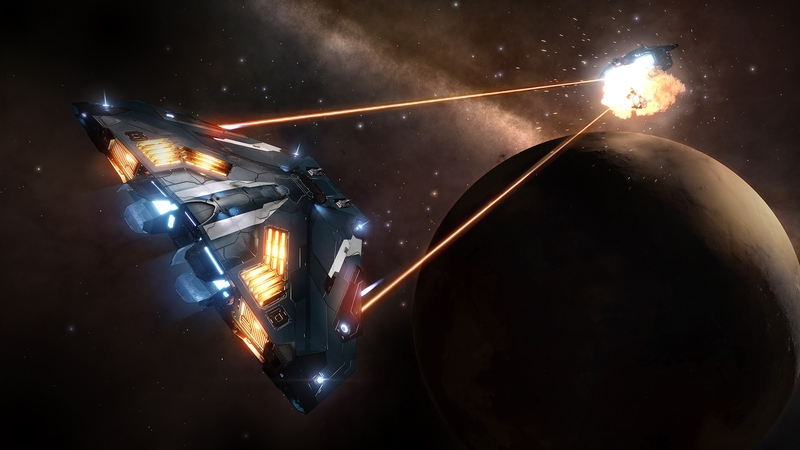 Let’s see what Elite: Dangerous offers to get the most out of the ships in combat. There is not perfect build I could provide you with, it really depends of your credits, skills, and gameplay. Count your credits assets. A battleship costs two to three times its base price for medium equipment. A full-fit outfit can go from seven to more than ten times the price of the ship alone! 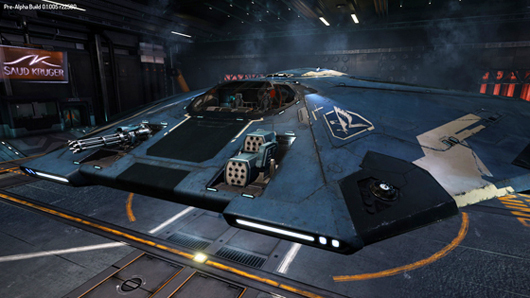 For example a top equipped Eagle MkII can reach 2 million credits. 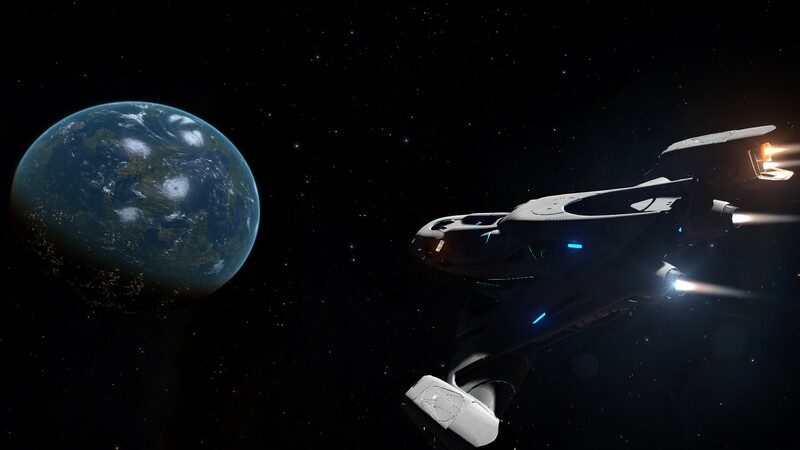 What will be the use of your ship: Missions? Assassination? Powerplay? Conflict Zones? Bounty Hunting in extraction zones, beacons, interdictions? Piracy? Player vs. Player? Role and use determined, choose your ship via the list below, sorted by price. Equip it according to your role. Do not be afraid to test out modules. 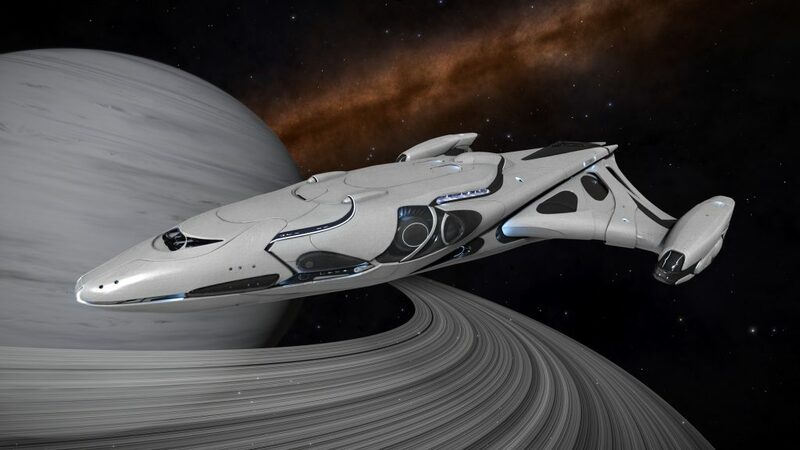 If ever, I would be happy to help you build a suitable ship for you, tell me the above information in the comments. Notes: 2 small weapons; it is the first ship that is given to us for free. It is very maneuverable, fast and has more armour than the Eagle MkII. 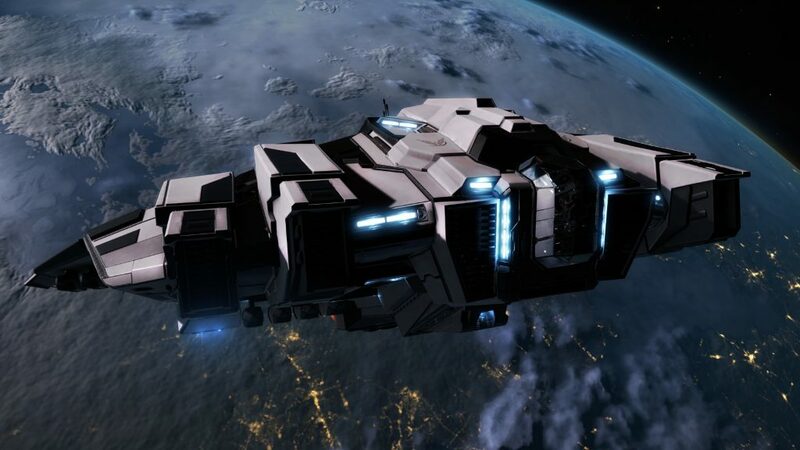 Start getting acquainted with this ship if you start the game. It is in every way a bit inferior to the Eagle MkII, so remember to put the top gear as soon as possible! Notes: 3 small weapons and very agile, the Eagle MkII is calm like a bomb! It has a small jump range and is very fragile, so I recommend a shield and a shield cell. Hardpoints wise it is common to see two multicannons below and a laser beam above. Notes: 2 small weapons below and 1 medium above. The Adder is rather agile and can even be an interesting frighter. Very popular among novice pirates. Notes: 2 small weapons below and 1 medium above. Faster than the Eagle MkII, more armour, more power for the shields but less nimble. Notes: 2 small weapons below and 2 mediums above. 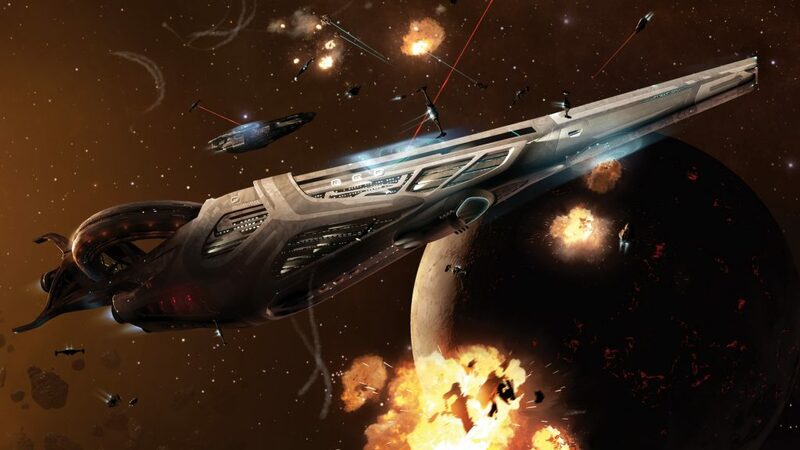 The weapons are grouped, the ship is light and very agile, the shields are excellent making it a very formidable fighter! Its weak points are its heat dissipation, its power plant and its relatively small jump distance. 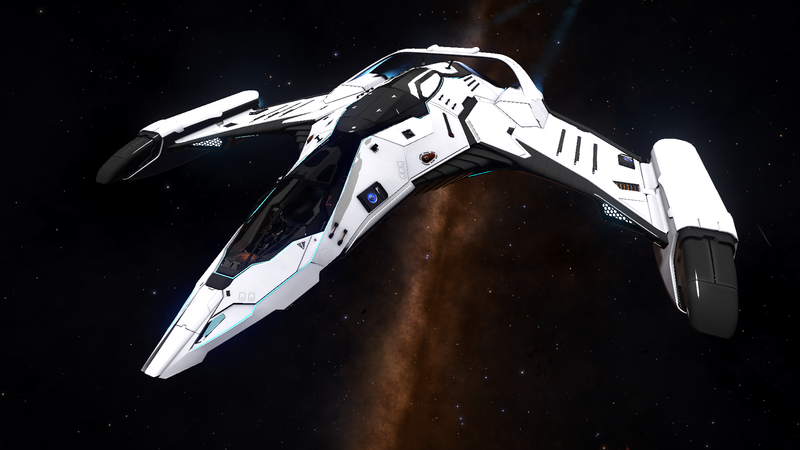 Other than that, the Viper Mk III remails remains a ship with which I had a fantastic experience of combat and piloting. Notes: 2 small weapons below and 2 mediums above. 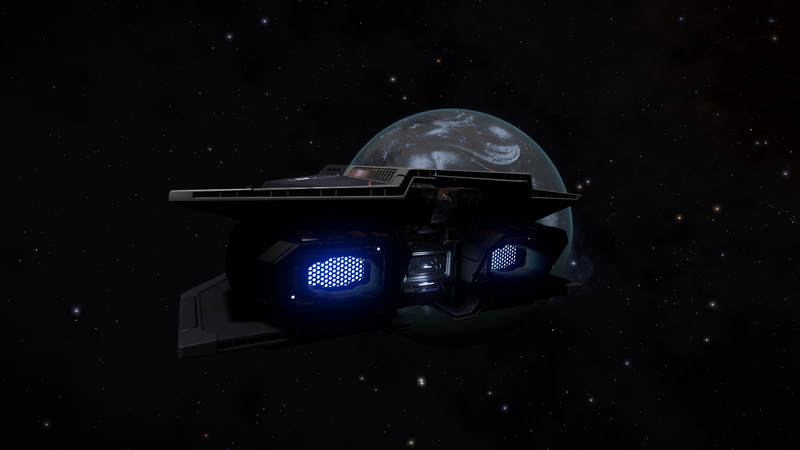 The Cobra can be a direct sequel to the Adder. It is very versatile and also has cargo space. His armour is high but its shields are rather weak. Note that it has a much lower average speed than the Viper… however its boost speed is standard the best out there! Think about installing a powerful Power plant. it is very flat and long in width, making it a difficult target to hit from the front and the back … however, when it turns and offers its back and belly, it can take enormous damage. 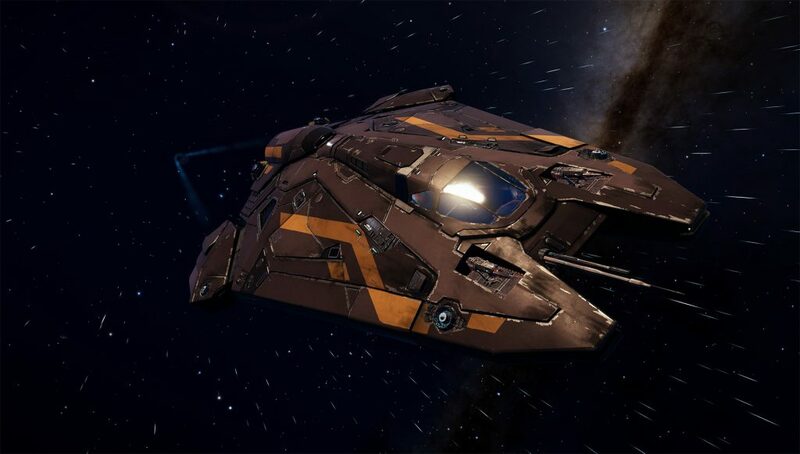 Notes: The Viper MkIV is simply a Viper MkIII with less speed, basic shields and a wee nerf to maneuverability… but with more armour and more power; This allows you to equip one of the best Class 5 shields and outfit larger modules. 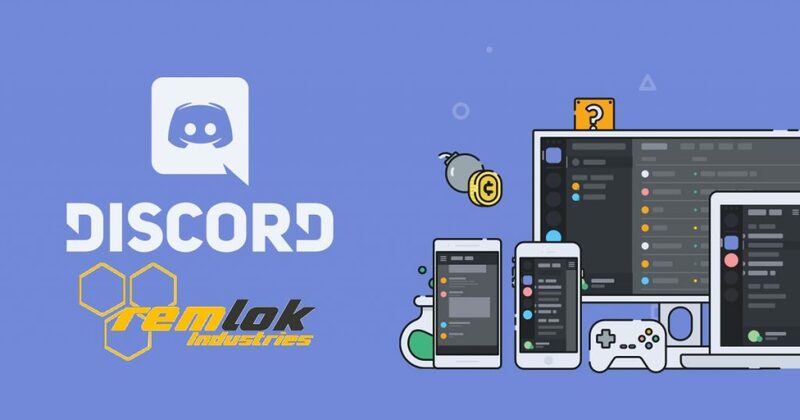 Its gameplay changes radically from its predecessor but it remains an extremely interesting vessel because of its low price and its capabilities. 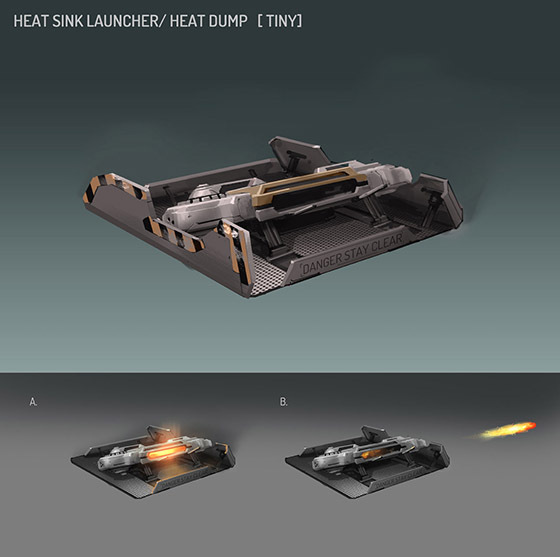 Prefer kinetic weapons because just like the Mark III, it dissipates heat poorly. Notes: 2 small weapons and 2 mediums on each side at the front. I currently use it as a Stealth ship. The DB Scout is a real hornet poking its target while circling around her. 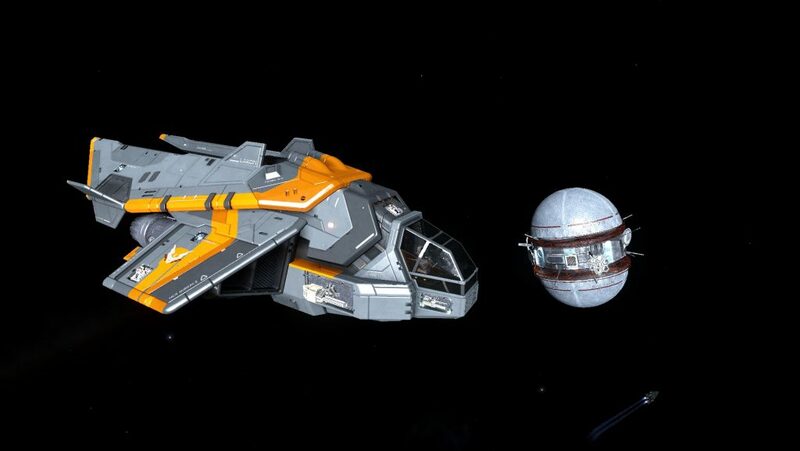 It is one of the most maneuverable ships in the game (with Eagle and Vulture) in every direction. The weapons are oriented forward, the heat dissipation is also excellent, making it a perfect vessel for fixed weapons such as railguns. Notes: 3 medium weapons placed under the nose of the vessel and on each side thrusters. The big pros of this ship are its shields, its weapons and its maneuverability for a ship of this size. 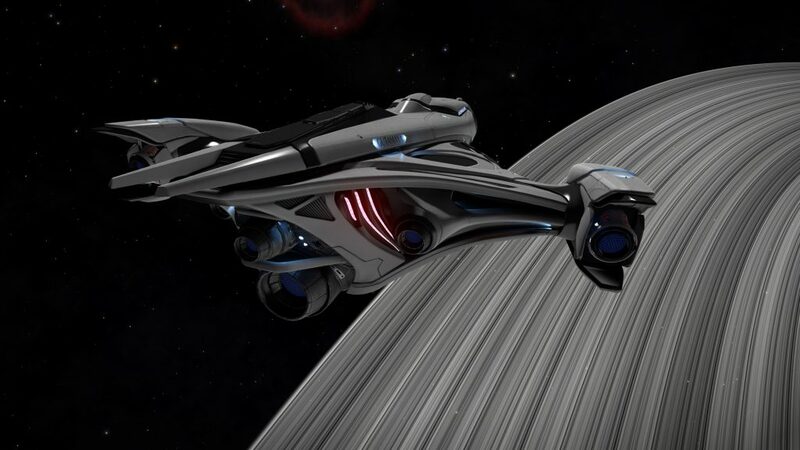 In addition to being one of the most beautiful ships in the game, the Imperial Courier proves to be an opponent to be feared. Its weak points are lateral and vertical thrusters. 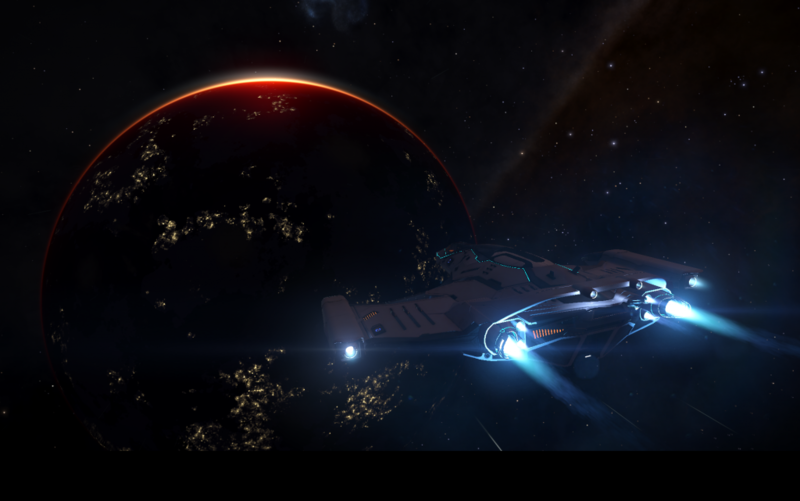 The Imperial Courier is reserved for the Empire at the rank of Master. 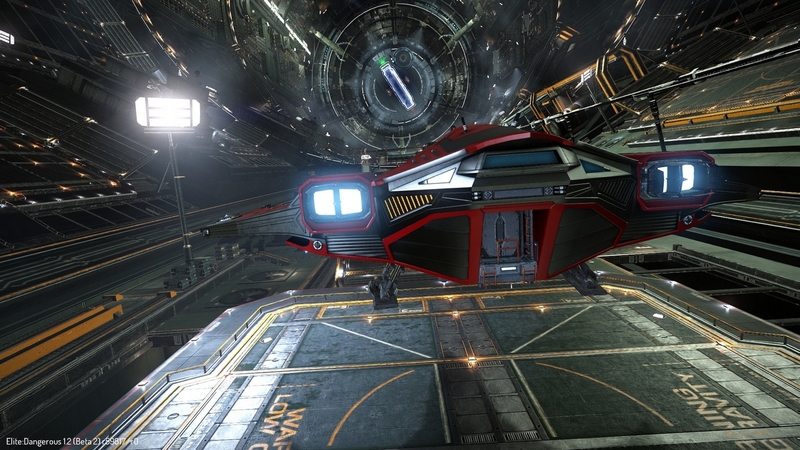 Notes: Yes, the Keelback remains a fighter, especially since it owns a launched fighter! 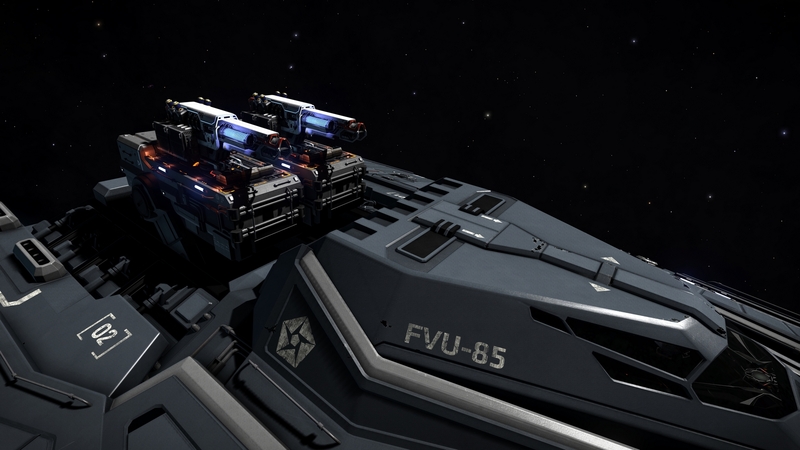 It has a large cargo ship and 4 hardpoints: 2 small and 2 medium. We are not here for its combat prowess or its defenses, but if you fight in a squad, you will be very useful! 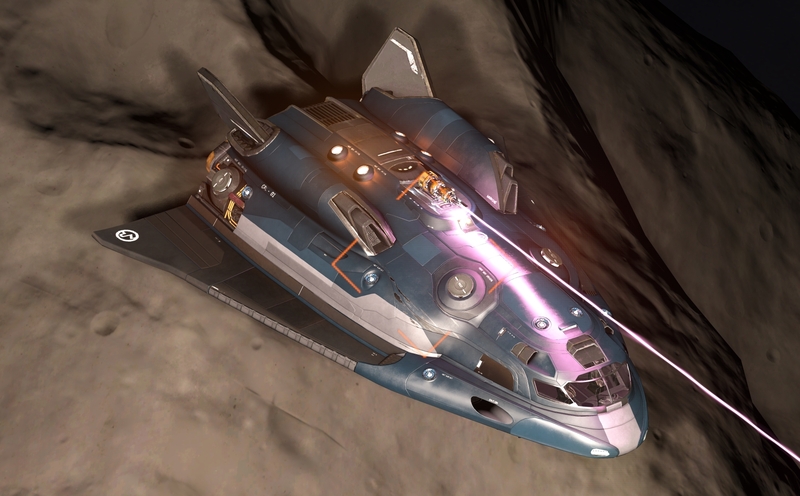 If you plan to fight and recover loot, it may be one of the best medium-sized ships. 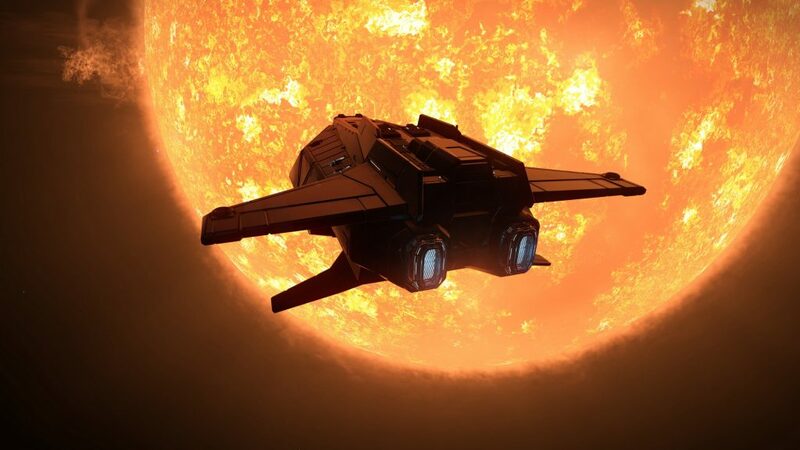 Notes: The Asp Scout is the little brother of the Asp Explorer. Good explorer jumping at 31.47 AL maximum, he has 4 hardpoints: 2 medium and 2 small. It retains its high armour hardness, but also has great handling, one of the best in the game with 8/10. Weak point, it has only 2 utility points. Notes: 2 Large weapons! 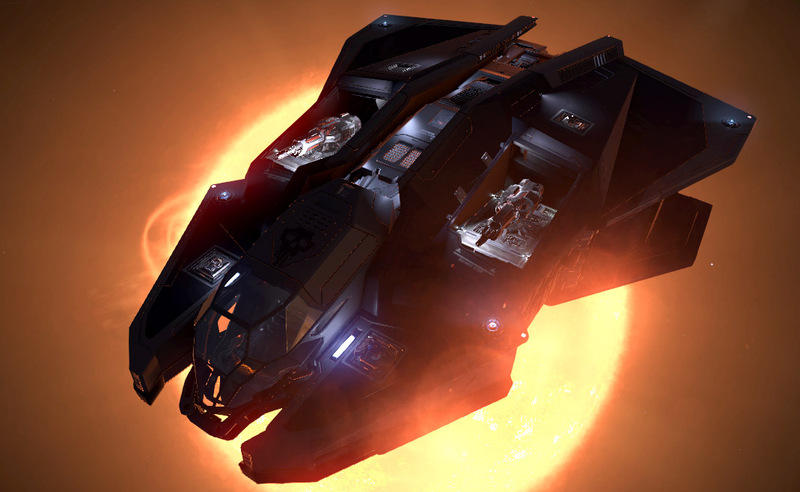 The Vulture pleases many Viper players because it has the same strengths and weaknesses. Very maneuverable, very powerful, very fast, excellent lateral / vertical thrusters but little power and a low jump range. It will make sacrifices in your modules and outfitting to specialize this ship… unless you can mod your Power plant with the Engineer! Notes: 4 medium and 1 large weapons. 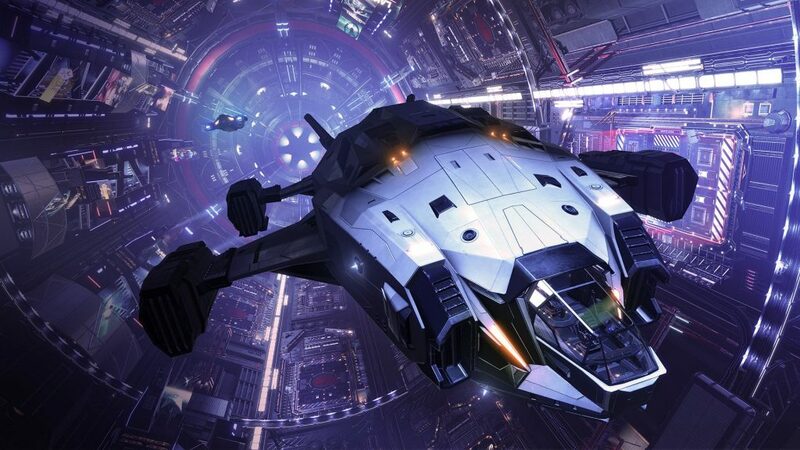 The Federal Dropship is not very pretty and is quite unwieldy, it also has little cargo … However, it excels in squad fights if allies can cover you! If you are not the main target, the Dropship will have the time to line up comfortably and fire all its firepower to his enemies because his weapons are perfectly aligned for forward fight. In addition it is very heavy and can absorb damage from its opponents without worries. The Federal Dropship is reserved for the Federation at the rank of Midshipman. Notes: 3 small weapons + 1 medium + 2 large. 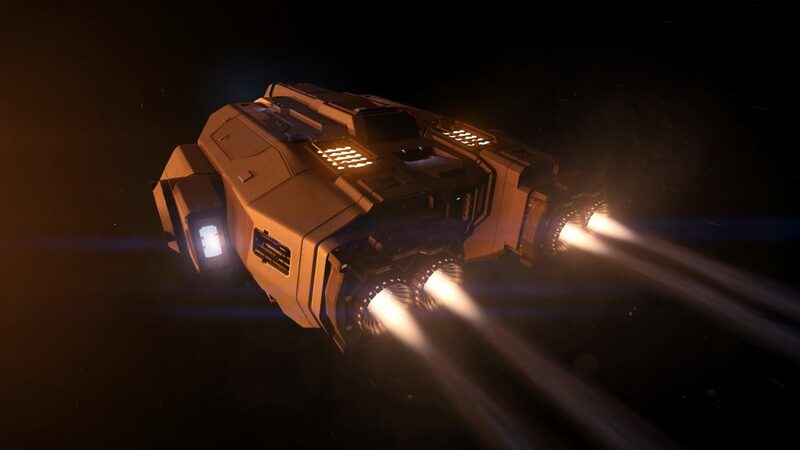 The Chieftain has many similarities with its neighbor, the Federal Assault, however it should be noted that the latter has his weapons mainly under the ship while the Chieftain has them on top: which makes hitting with it much easier. carry. The Chieftain is slightly faster than the Assault but slightly less tanky in armor. Its shields are relatively weak, rely mainly on its hull. Unlike the Federal Assault, it has a better internal modules and can at least boost its shields if you wish. Unlike the FAS who likes to boost very regularly, the Chieftain is better played in the blue zone. Notes: 2 medium and 2 large weapons. The Federal Assault is much more nimble and fast than its cousin the Dropship. It has a much more aerodynamic model and fewer superfluous modules to make it a ship specialized in combat. Very effective when you keep your thrusters open and you boost regularly to take advantage of its great maneuverability. Note that it is difficult to dissipate heat and therefore it should not be overloaded with energy weapons. The Federal Assault is reserved for the Federation at the rank of Chief Petty Officer. Notes: As the Federal Assault but much less agile, the Imperial Clipper has 2 medium and 2 large weapons. This ship is extremely fast and has a very large freight. His weak points are its lateral thrusters and its weapons widely separated which prevents it from effectively using fixed weapons. His shields are also quite weak. Count it more like a freighter with fighting abilities. 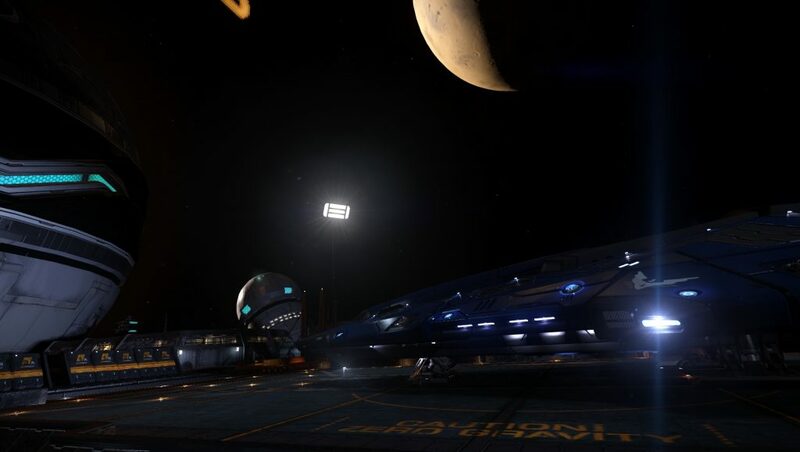 The Imperial Clipper is reserved for the Empire to the rank of Baron. Notes: 2 small weapons, 4 mediums and 1 large; the Federal Gunship is a big and slow tank with turrets. 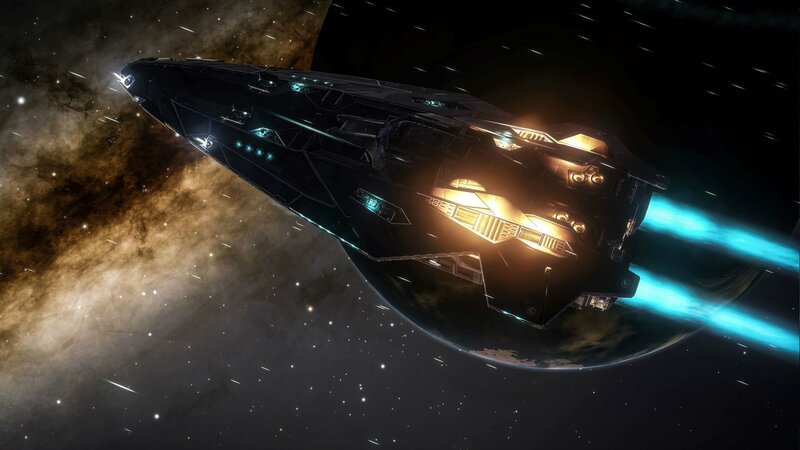 He is one of the ships with the most armour and mass in-game (for its size), making it a formidable fortress. The Gunship does not have a long jump range. It is very, very, very effective in squad combat if it is not the primary target. 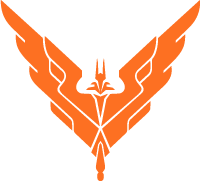 The Federal Gunship is reserved for the Federation at the rank of Ensign. It has a fighter bay. 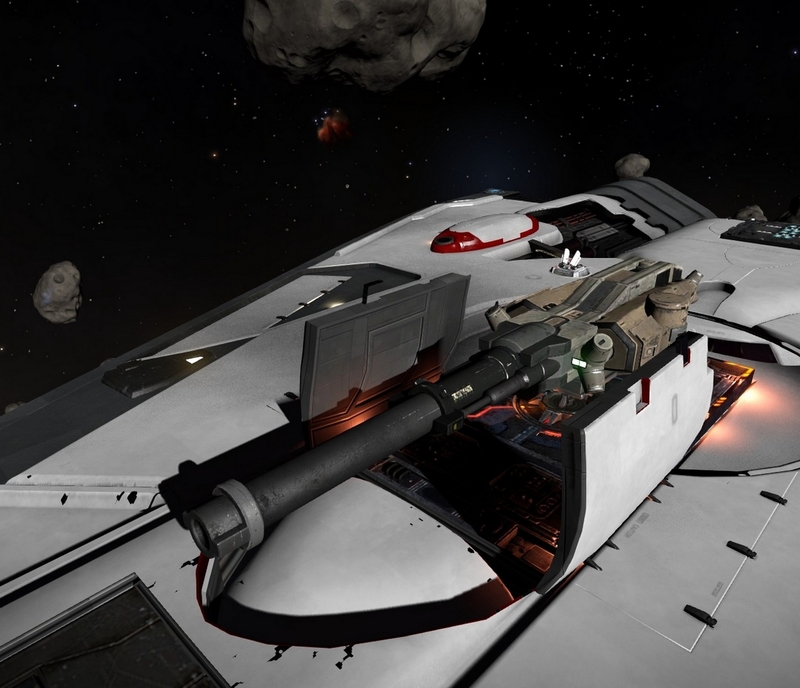 Notes: 4 medium weapons and 1 huge, the Fer de Lance is a fantastic heavy fighter and is extremely nimble for its size. Its shields and armour are not its strong points but if you know how to fly a very agile craft and play Fly Assist Off a little, go for it! Generally the Fer de Lance is played with Gimballed weapons but if you master the beast, do not hesitate to play only in fixed weapons to unleash its true potential! Notes: 2 medium and 3 large weapons. 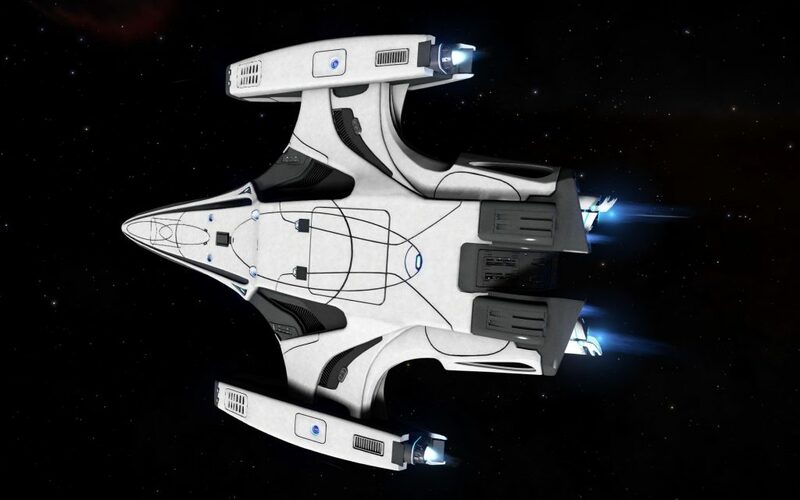 The Python is for me LE ultimate fighting ship. Extremely scalable, powerful shields, interesting thrusters, a judicious weapons placement, sturdy armour, a good jump range, a very large cargo and a good Power plant allows you to use everything you want! Its weak point could be its speed and its ability to quickly turn. It will take a lot of training and a mastery of FA off to better fly this versatile monster. 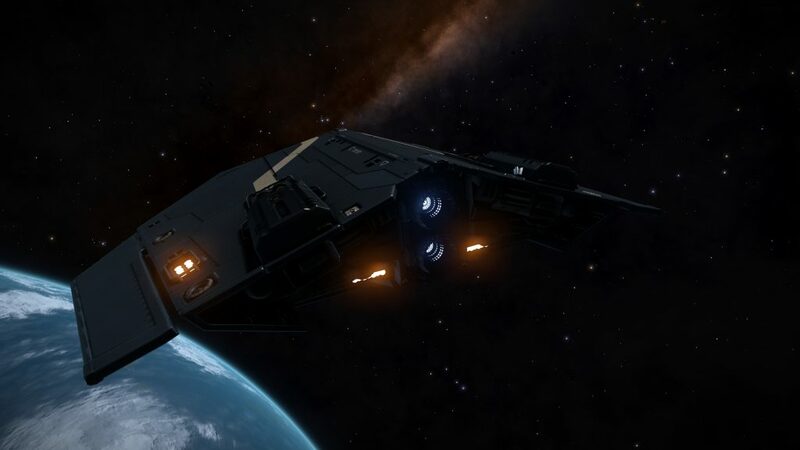 Notes: If you like big slow ships, very sturdy with weapons in all directions you will be delighted: the Defender Type 10 has nine weapons hardpoints! 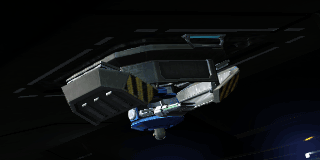 With the biggest possible DPS in-game if played correctly, the Type 10 can cause very heavy damage and scare Cutters off if it wants to. Its shields can be very powerful thanks to boosters, its hull and armour are some of the biggest in-game but obviously it is very, very slow. Stay in the blue zone to have a decent turn-rate. Its Power Distributor is quite weak, mod the capacity / regen rank V of the latter or equip a Guardian distributor there. It has a fighter bay. 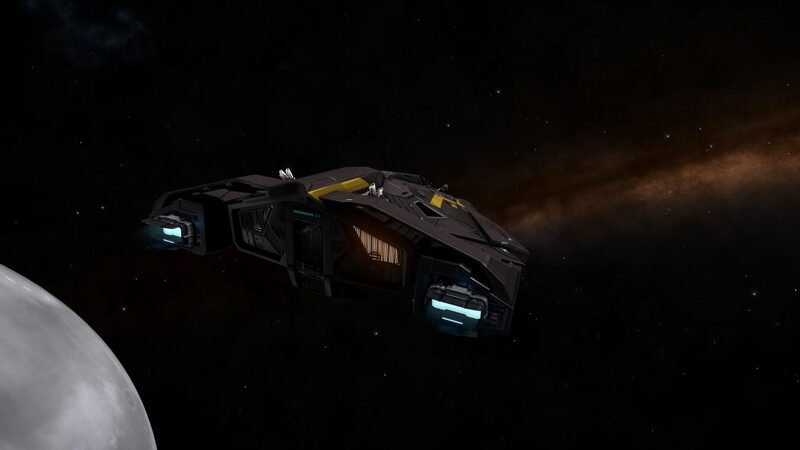 Notes: The Anaconda’s maintenance and modules are very expensive but once properly equipped, you will be able to attack multiple targets at once and use gimballed weapons or turrets. Be careful not to lose it because its insurance is very high; to fly with care if you know your limits perfectly. 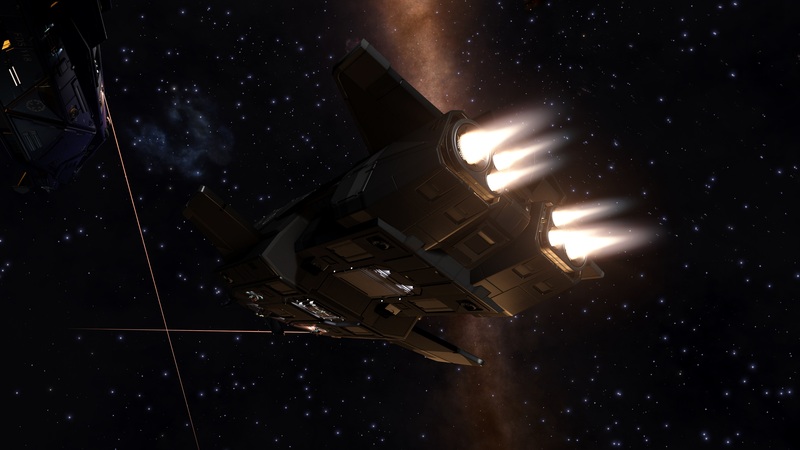 The Anaconda has some problems to turn fast, so you have to regularly use a boost to place it correctly. With so many weapons, the Anaconda can strike back more or less easily, but attacking it from below, towards the rear, is advisable. Use turrets when you play an Anaconda and think of equipping powerful fixed weapons C4 and C3 under the nose of the aircraft. It has a fighter bay. Notes: This beast is heavy, you can unlock it at the rank of rear-admiral for the Federation. 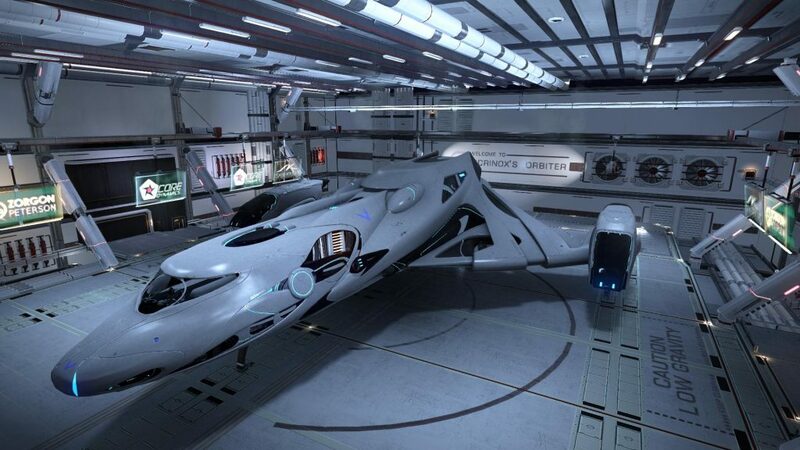 It is the only ship in-game to equip two huge class 4 hardpoints and 1 large, 2 medium and 2 small. Its maneuverability is low but as a super-heavy corvette: no surprises therefore. Its thrusters are very effective, it makes it ultimately an excellent vessel “zoom and boom”: Alpha Strike! 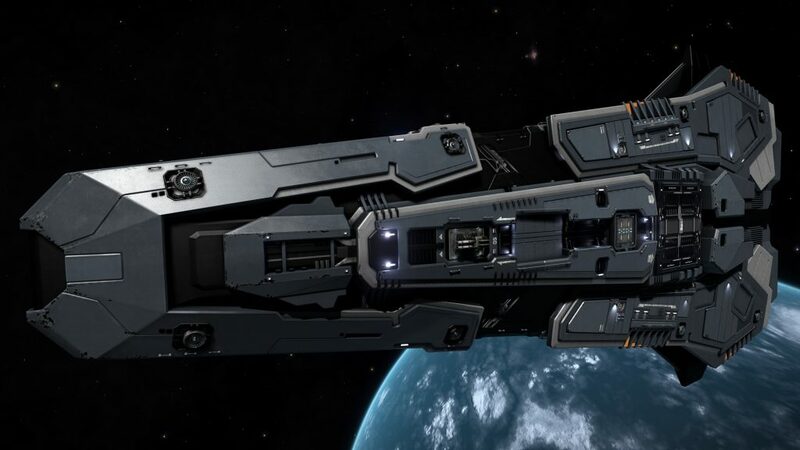 Other than that, it… doesn’t… jump… far… Its armour and shields in combat are extremely effective but to have an excellent ship, it is necessary to spend a lot of credits… this is therefore reserved for very rich players. It has a fighter bay. Notes : The most expensive ship in-game currently. 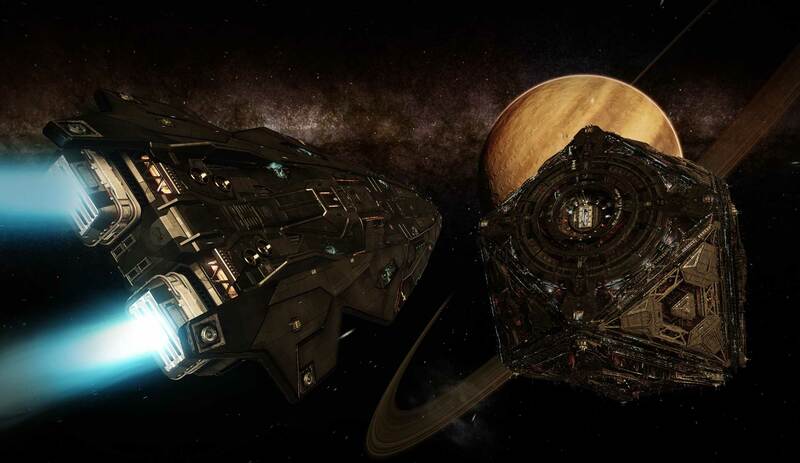 The Cutter is a transport-oriented ship with its maximum cargo of 792T, making it one of the best trading ships. Often used in combat because of its weapons (1 huge, 2 wide and 4 medium), it can slam quite quickly a powerful punch. 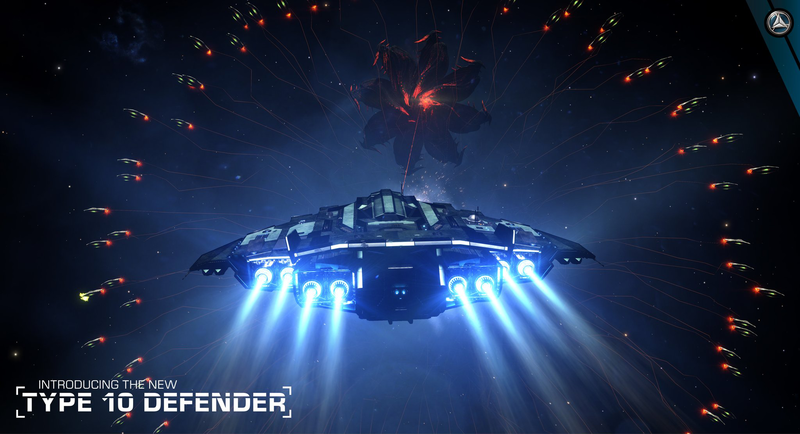 Like the Anaconda, the Cutter is incredibly sturdy and its shields are known to be “indestructible”. Viper MkIV, 11M 602k // 4 Multicannons, extremely fun to play with its corrosive and thermal mods to cover several resistances against enemies. Agile and fast, a cheap ship that wreaks havoc on small and medium targets. 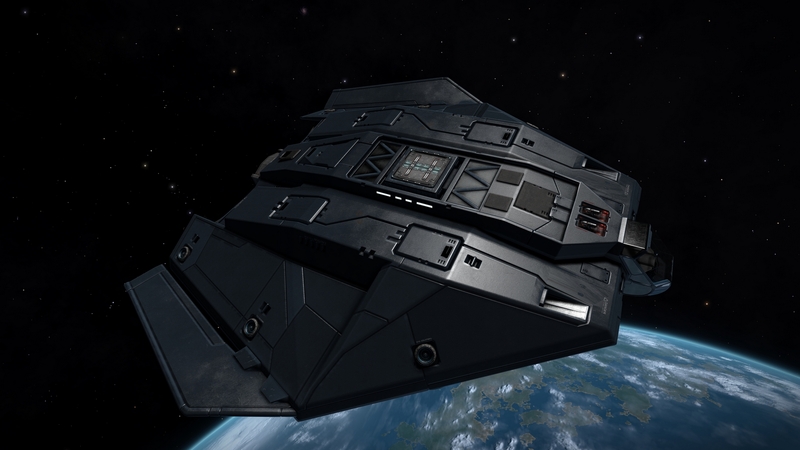 Diamondback Scout, 15M 744k // A stealth ship. Its profile, placement of weapons and weapons allow him to deliver powerful blows to his target. I prefer to use it in a wing because it is not the most effective against the shields, as a solo fighter. You can use two railguns instead of the multicannons if you prefer. Asp Scout, 18M 962k // This ship proved to be a real little bomb countering 100% of enemy resistances thanks to its absolute damage. It balances its poor top speed with incredible armour and hardness for a ship of this size. Its shields are recharged very quickly thanks to the bi weave fast charge. Just aim, and this toy is yours against medium and small targets. Vulture, 31M 743k // Pacifier frag cannons are top notch with the Vulture. The definition of heavy fighter makes sense with a Vulture Frag. 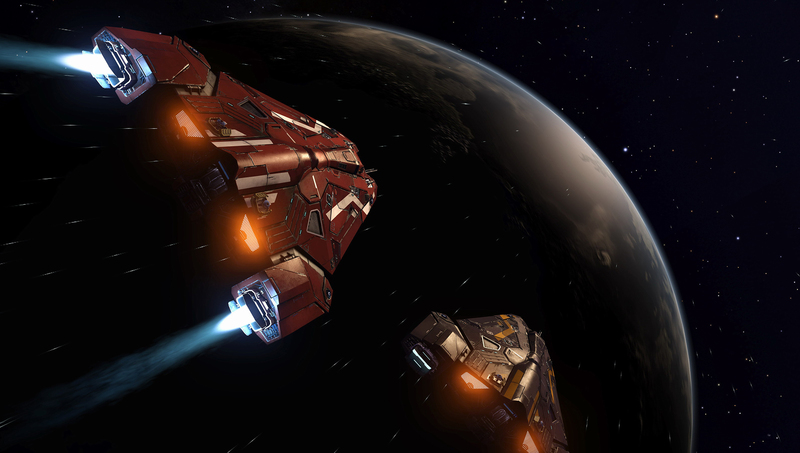 Federal Gunship, 130M 353k // Choose a conflict zone, sit back and relax with your two fighters. The weapons and mods of this Gunship offer incredible firepower, coupled with two fighters played by humans you will be a real titan in your category. Each fighter adds C3 weapon power, potentially making it a 3C3, 4c2 and 2 C1 vessel! Remember you are slower than a sloth that ate onionheads: you are made to secure an area. Fer de Lance, 212M 222k // A fairly standard build that works great with the C4 laser beam shields (damage over time), then slash your target after the shields collapsed. Very fast, very agile, but fragile. Play FAoff for a better potential. 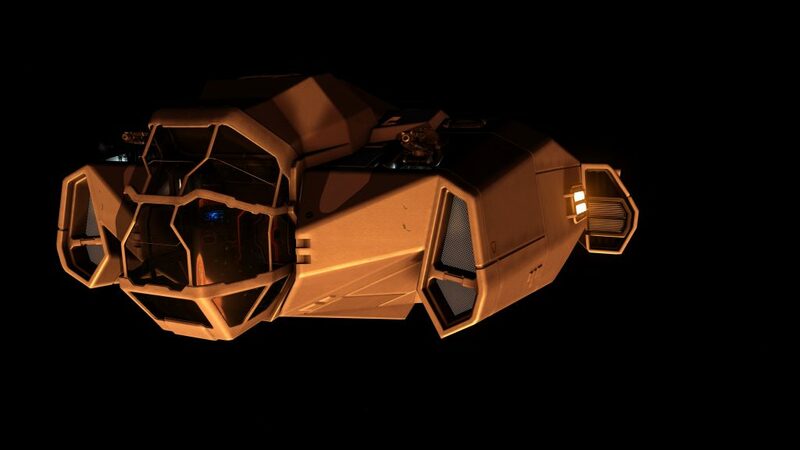 Fer de Lance, 218M 620k // Same as the previous FdL, you will eat through the enemy’s shield with absolute damage thanks to Plasma alpha strikes, before targeting the selected sub-modules: Power plant or thrusters mainly. Mamba, 204M 962k // A fully armoured Mamba based on explosive damage and rapid target destruction thanks to its anti-shield torpedoes, rockets and C4 hardpoint. It requires excellent control of heat and energy pips, if you don’t want to finish like a grilled toast. Chieftain, 108M 474k // Playing a Chieftain is always a good idea, even more with an explosive Plasma/Frag and the agile and fast capabilities of the ship. Proven effectiveness in PvE and PvP. Quick bi-weave shields and a lot of armour on the top. Anaconda, 560M 542k // My Anaconda tank, hard to play and requires practice. It is intended to last and apply continuous damage with the pips in sys and wep. I use the eng pips points only if I’m behind the target, to improve my placements, but its main role is to tank and hit whatever the target’s location is thanks to my turrets and fighters. 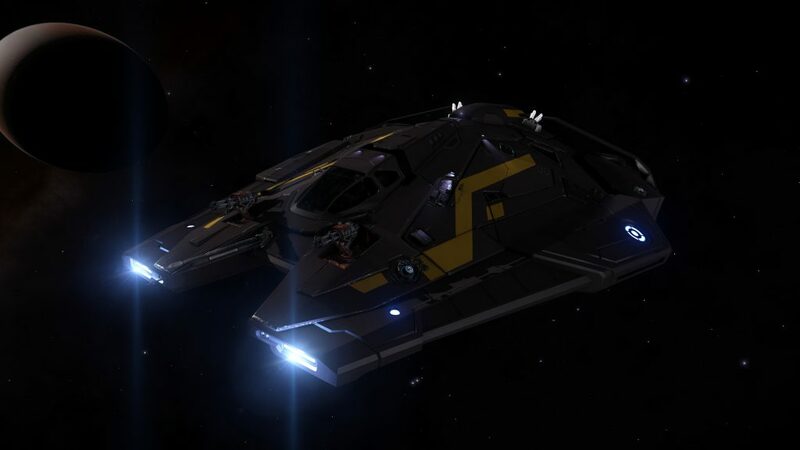 Federal Corvette, 890M 641k // Jewel of the Federal Fleet, this build is incredibly powerful. Interesting speed, very high resistances, hull points, and shields. The build is not the most effective for hitting the enemy shields, but its role as a tank makes it possible to eat constantly through the enemies’ shields, thus creating stress on your victim. Once the shields collapse, it’s the end for your foe thanks to the double C4 Multicannons and the additional thermal weapons you bolt. ► You too, propose your equipment on Coriolis.io and share it in the comments! In red, the mandatory modules for your roles. If you can’t afford a A rated module, buy a C rated one as it is balanced “Power/Mass/Power Drawing/Integrity”. The D rated modules are very light and unfortunately very fragile, while the A rated ones are sturdy, powerful and very expensive. 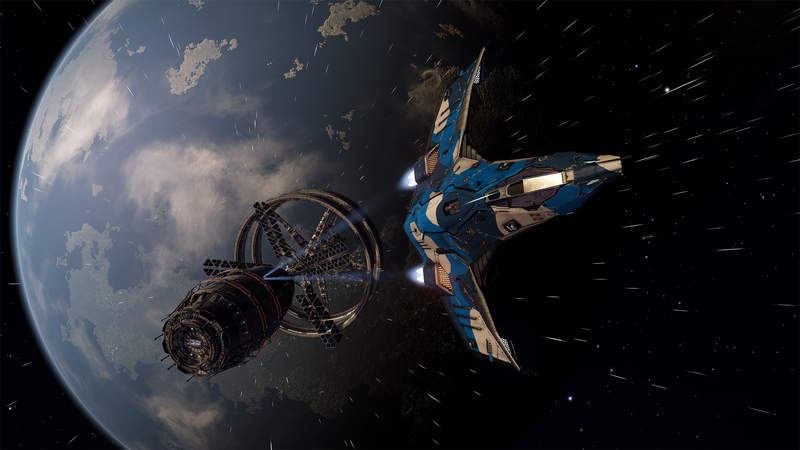 There are two good websites to fit your ships, E:D Shipyard as well as Coriolis, according to your preferences. Don’t be afraid to fully upgrade a ship before buying a new one as the modules’ prices won’t change and you can resell it 100% of its price while your ship will be 10% off. Offensive and defensive modules are available in game. We will discuss their uses in detail in order for you to best equip your ship according to your gameplay. → Learn more about the Shield Generators. 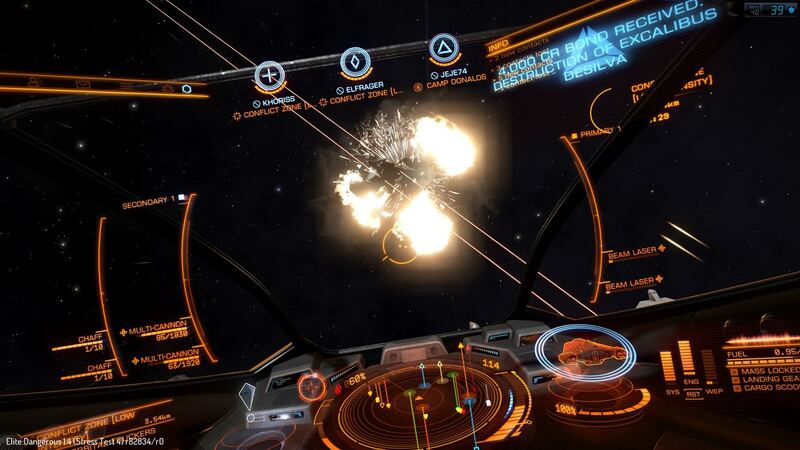 Mark Allen, Programmer for Elite: Dangerous, gave us some details about the mechanics that helps calculating the “Damages” during combat. 1) The first step is to multiply the damage dealt by the armours’ defences as for shields. So a small pulse laser (20) would deal full damage to a sidewinder (also 20), but less than a third damage to an anaconda (65). The main intent of this mechanic is not to penalise small ships, but to make large weapons effective against large ships without one-shotting smaller vessels – they don’t actually do that much more flat damage than a small weapon but by piercing much better are far more effective against the harder target. 3) Next we decide if the shot has penetrated the armour. 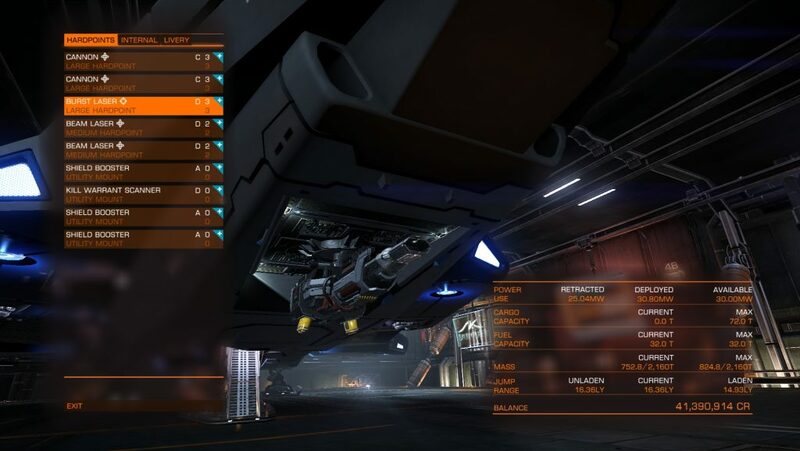 This is a random chance that scales with current hull health. The exact values vary per weapon though a typical example is 40% chance when you have full health, 80% when close to death. If the penetration roll fails then we deal all damage to the hull and skip to step 8. These spheres are used in two ways, if the point you hit is inside an external (blue) sphere then that module is the one that was hit, skip to step 7. If you missed, then the internal spheres will be used in the next steps. 5) If the shot has penetrated and not hit an external module we need to know how far it went into the guts of the ship. Each ship defines a standard penetration depth (usually 75% of its height), which is then modified up and down by weapons. Aside from the ever-powerful railgun which will go all the way through any ship currently in-game (but still can’t hit a second ship!). In the current live build (1.3.07) there’s a bug where this penetration distance is much larger than intended, which has been fixed internally for 1.4. 6) Given where it hit, the shot direction and how far it penetrated we can draw a ray through the ships’ internal layout to check what may have been hit. This ray is compared against all the internal (yellow) spheres and any that intersect are candidates – one of which will be picked at random weighted by how dead-on the hit to its sphere was. If nothing was hit, skip to 8. 7) Whether internal or external we now know that you’ve hit a module. 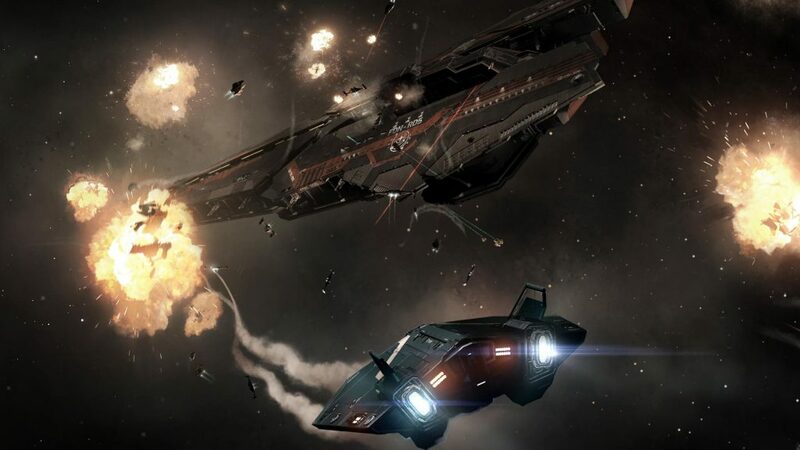 The damage dealt will be split between the hull and this module in a ratio determined by the weapon – most of them deal the majority (80%+) to the module. There are no further defences applied at this point, as the Hull armour has already done its work (even for external modules, they’re assumed to have toughened outer surfaces). It’s at this point the module may also malfunction if it has taken enough damage. 8) Whatever damage that wasn’t dealt to a module is now dealt to the hull. 9) After dealing damage there’s one final step of applying secondary effects to the ship and/or modules hit. This encompasses options like heating up the ship or forcing additional malfunctions. I will not discuss about Powerplay or Guardians weapons in this guide. ✔ Thermal weapons don’t need ammunition or reloading time. Thermal damage. ✘ It consumes a lot of power from your Generator. Notes: It is possible to maintain the Pulse laser during a long time as it doesn’t draw a lot of energy from your distributor. The penetration score is interesting and you get a great deal of damage against shields and hull. Notes: Between the Pulse and the Beam, the Burst laser is an excellent weapon to eat hull and shield if you can afford to hit with the three round burst and if you have enough power. Power Draw: 0 1  3 4 5 6, depends how long you fire. You will have to maintain the beam, it will cost a lot of power. Notes: Very powerful against shields, you can also completly melt small ships with this. It generates a lot of Heat and you will need a lot of capacity and regeneration in your power distributor. It doesn’t penetrate well, it is more to spread heat and kill shields. ✔ The balistic weapons doesn’t draw that much power. Kinetic or Explosive damage. ✘ They have limited ammunition and ammo per clip, they need to be reloaded. Notes: Efficient against the hull and great at aiming given sub-modules. It’s almost useless against shields, but it costs quite nothing from your Power generator. Notes: Really dependent from your attack angle, it can cause massive damage to multiple modules and hull. You will have to be close to your target. Very good against the hull of small and medium ships, great against shields. Notes: Excellent penetration, it is used to snipe down given modules. The shell are slow so you need to prepare your shots. Notes: There are two sorts of Missiles racks: Seekers and Dumbfire for guided or rockets-style. Large explosive damage in a sphere and can damage multiple modules. Useless against shields. Be careful about Point Defence and Countermeasures, they will destroy or destabilize them. Notes: Increased penetration, speed, damage. Focus a submodule like the generator, it will cause massive damage! Be careful about Point Defence and Countermeasures, they will destroy or destabilize them during a short time before it acquires lock again. Notes: This is not played a lot, it depends your gameplay if you use a very fast ship Fire & Forget to create clusters of bombs. Be careful, you can also take their damage. ✔ The hybrids weapons draw a LOT of power. Thermal, Kinetic and Absolute damage. ✘ It needs to be reloaded quite often. Notes: Size 1 or 2 only however their damage/penetration counts as a size n+1 for the statistics. Gigantic armor penetration, you can literally penetratres through internal modules with well placed shots. Notes: The most powerful weapon (besides new Guardians weapons), exists in size 2 and 4. Its power comes from great responsibilities its absolute damage, ignoring ships’ resistances. 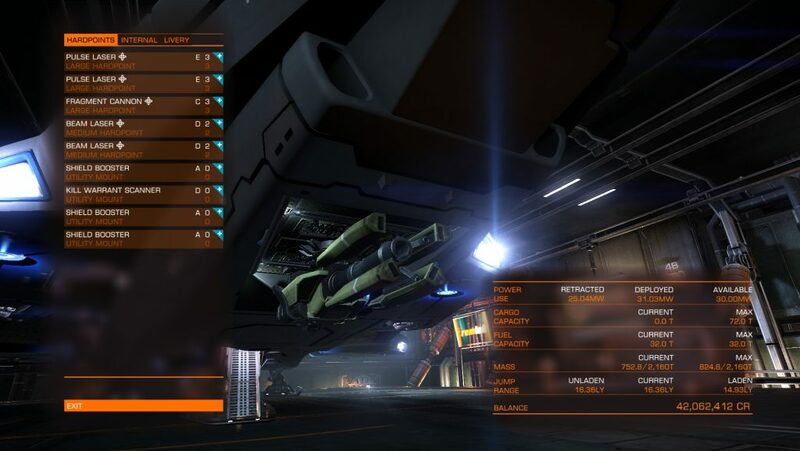 Utility modules to further specialize or defend your ship. Greatly disturbs gimballed weapons during the temporary chaff. Misunderstood, they are quite easy to use actually. You can destabilize missiles and torpedoes shot against you on a given range. Everything around you is hit! Charge it, release it. Used to absorb your ship’s current heat. It helps disturbing gimballed weapons and keeping your profile hidden from the radar. Efficient against mines, torpedoes and missiles if they aren’t in great numbers. It automatically shoots them down. Used to discover the contents of a target’s cargo ship. Often used by pirates. If the target holds illegal commodities, they will be flagged as Wanted. The targets are always alerted when scanned. Used to calculate the jump coordinates of a ship using the wakes left behind when jumping. It is used to hunt down targets. Often used by pirates. Display all bounties on a given ship. Used to passively enhance the power of your shields for a fixed rate of energy when activated. 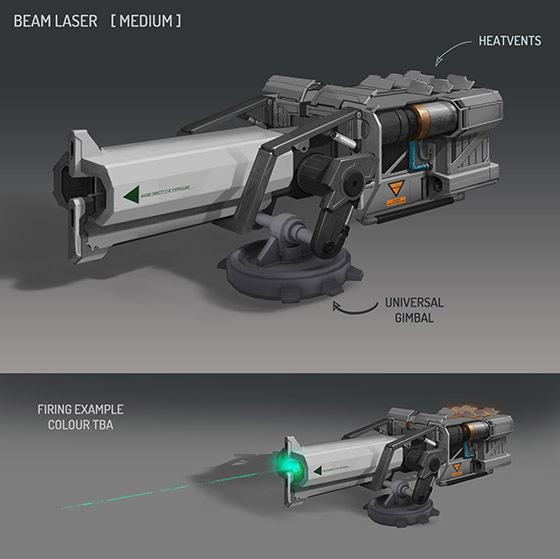 We focus on well placed Plasma shots, the Pulses are mainly used to help keeping the DPS high. 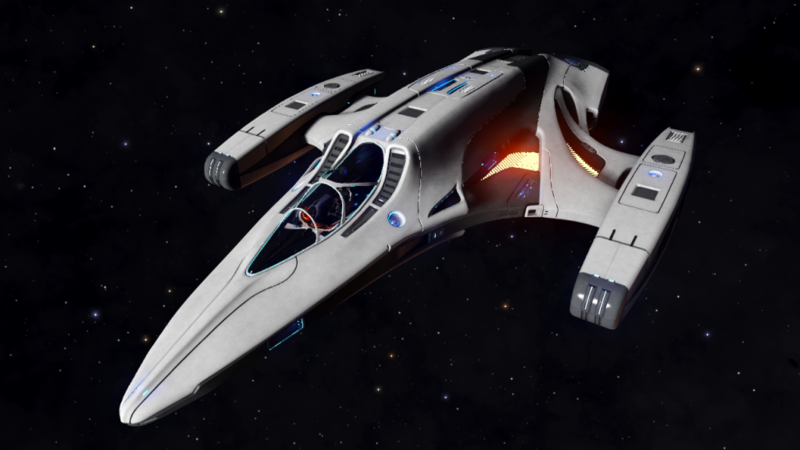 With a standard Python, it might be hard to increase its shields very high due to the Plasma Accelerator drawing a lot of power. Mainly focused on the gusty attack thanks to the extreme mobility of the FdL coupled with a cannon shot whenever possible. The Viper has little energy available, even with a great Power Generator. Aligning 2 Beam Laser C1 and 2 Multicanons C2 will make it a killing machine. The Gunship lacks speed but excels in its own way. He is a slow but formidable killer, and you got a Fighter with you. Generally, try to pair an effective weapon against the hull and an effective weapon against the shields; for example a cannon/multicannon + a laser beam. Like I explained earlier, there are different gameplay types. Let’s dive in a little bit more, shall we? → Don’t forget that since 2.1, you can add Special Effects to your weapons and now to your modules since 3.0. Thanks Mrs and Mr Engineers! 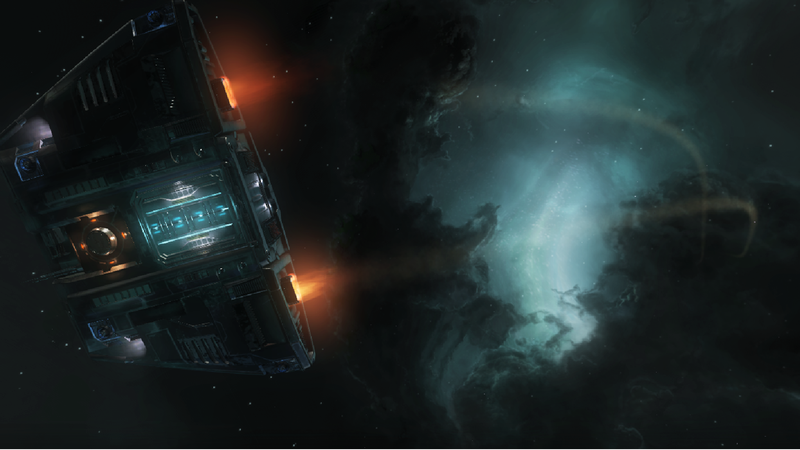 → The Engineers allow you to even more customize your ship to reach the desired gameplay. 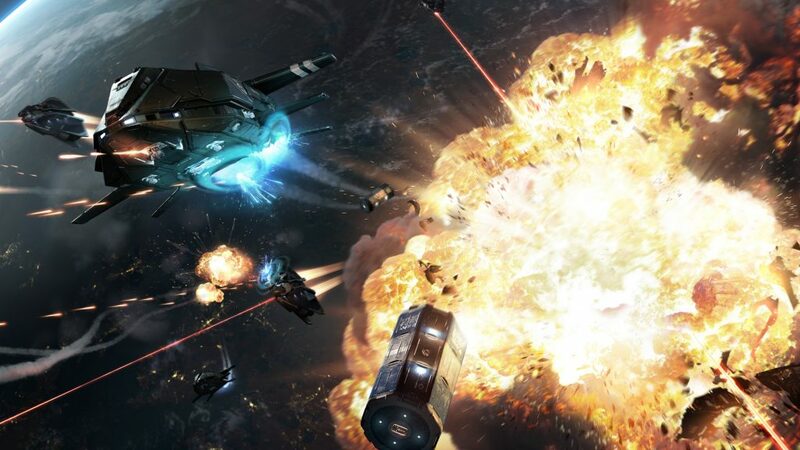 These are only four common examples, you could play as a Support regenerating your teammates’ shields, a sniper with long distance railguns, a huge battery of missiles/torpedoes/rockets/pack-hound, a versatile ship, an impaler with a great mass ramming targets, … the choice is yours, and the limit is your imagination. By far, the most complicated of all as you will need to use Silent Running while not frying your ship and your pilot down, flying with Fly Assist Off, aiming at your target… yup, you need to master your art! 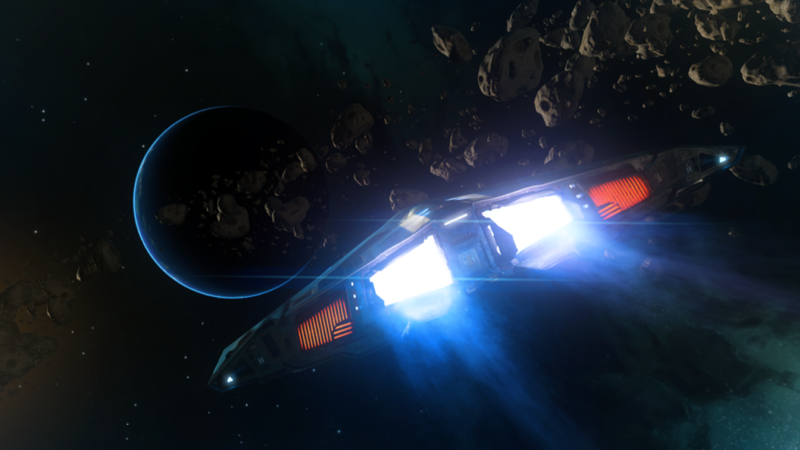 Going Silent Running will close your heat vents allowing for the heat dissipation from your ship. The sensors, scanners and gimballed/turreted weapons will loose track of you, you will go off radar. The heat from your ship will increase as time goes, and it will increase even faster if you use modules and weapons until your re-open your heat vents. Stealth players need to use multiple Heatsinks. Play well away from your opponents, between 500 meters and 1.5 kilometers at the most. Switching to silent mode cancels your shields, which is why stealth hunters do not use shields. You will need to count on a good armour and a very agile ship. Exercise your FA off by maneuvering around an asteroid or a friend of yours. Use your side and vertical thrusters! 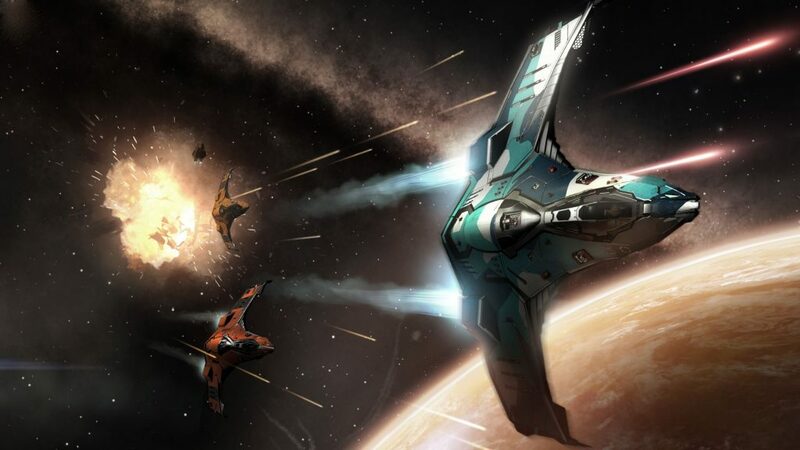 Fighters are hunters based with excellent shields and their great firepower to get the enemies down before losing their shields or too much hull. They are quite nimble and are designed to fight for a long time without the need to reload or get ammunition on a station. Energy weapons are therefore their favourite, but mixtures can exist. The engagement distance of your enemies is something you must know so you don’t get outturned in melee (<500m) or inefficient at long range (>2km). Lasers are more effective when they are close. From 3 km you can hit your target but from 1.5 km the damage will become much heavier on your target. Try not to get too closed as I said, especially if your enemies are small because they will surely be more agile than you and you will not have a great angle to fire at them. 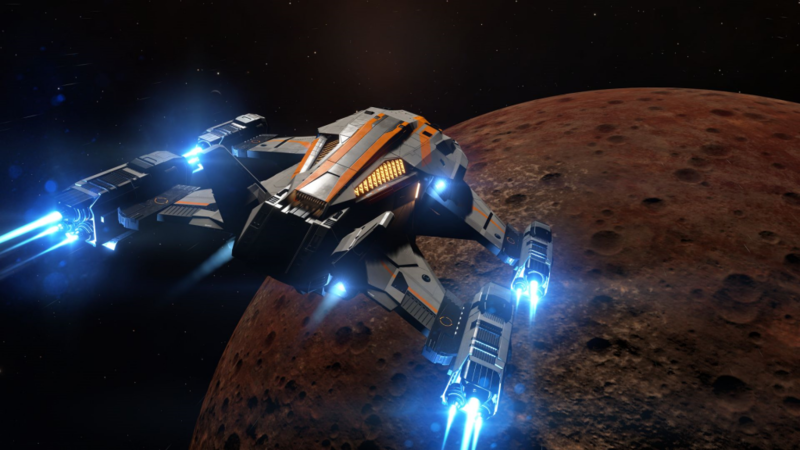 Learn how to properly manage your thrusters and FA off. That’s an excellent offensive and defensive bonus. 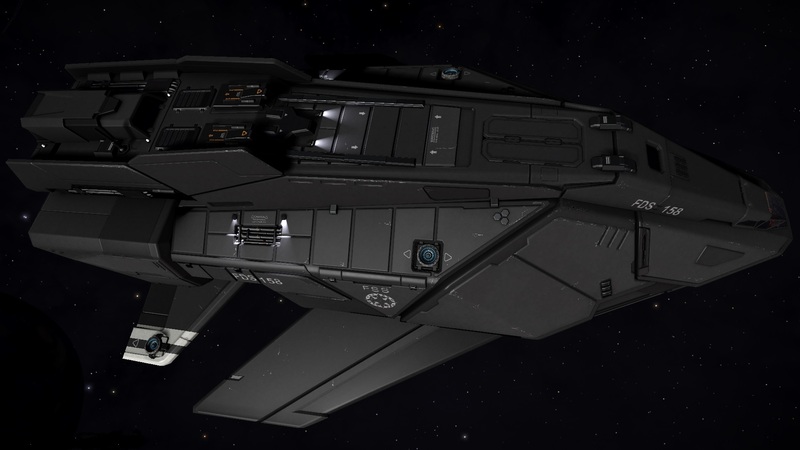 Some ships like the Fer de Lance are excellent at 50% speed in a fight most of the time, others like the Federal Assault Ships are better if they boost quite often to help with their masses. Of course… don’t overheat! There are not many tanks in-game as this usually requires a team to coordinate. Your role will be to be a bait, a threatening bait with no shields. You will attract the enemies, but what a chance, you’re deeply packed with resistances, hull and modules reinforcements. The enemies will have a tough time killing you or understanding that you should not be the priority target, thus losing time during the fight. Great shields / bi-weave, are interesting, but what you are looking for is mainly in the structure of your ship. You could do both, it all depends your gameplay, for example my might Anaconda is a heavy tank with excellent shields, modules, resistances, 2 fighters, turrets, fixed, gimballed, … well yeah ok it’s a complete Anaconda. You need deep armour plates, which will reduce your maneuverability. Class A modules are therefore to be expected, especially for the power plant because if you loose your power, you’re out. Do not be afraid to ram your target. The tanks have a very strong armor and a heavy ship absorbing damage without problem. The Federal Gunship has excellent engines which allows it to turn around very quickly if it keeps its speed within the maneuverability limit (blue zone). Keep in mind that you will be very unwieldy at high speed and that you will not be able to run after a target. If it disengages you, you are unlikely to catch up. So take your time, walk around at a good speed and enjoy the show by shooting at will. Hunters represent the standard attack ships. These are specialized in maneuvrability in order to out-turn their opponents and weaken them constantly. Their strength lies in their dodging capabilities, a single mistake could be fatal. If you find yourself in front of enemy cannons, I do not give much of your skin. You will need the thrusters to be Top tiers and a great Power plant / Distributor to continuously shoot at your enemy. bi-weave shields are useful, but if they collapse, be sure to switch to silent mode so you do not take too much damage. Stay mostly in the blind spots of your targets; ie behind or where there are no weapons. Master Fly Assist Off so you can reverse very quickly or perform translations to keep your enemy in front of you while you move. Here are the keys to an effective hunter. The Power Plant is the core module, your ship’s heart. It provides the energy needed to power your modules. The latter has a number of “health points” represented by a percentage, in the module panel, on the right. The lower the percentage, the lower the energy it generates. The danger becomes critical at 0% life: the energy generated will be 50% of the base value. There is also a small chance your ship will explode when the Powerplant is at 0% while your foe keep damaging it. Weapons with a high penetration value are very effective in destroying internal modules; The Power Plant is one of them. If a module fails to work, a solution is to Repair/reboot. This process completely shut off your ship in order to try a reboot on some modules experiencing issues. You will find this option in the right-hand menu, last tab, at the bottom of the list. Even with a reboot, it is still extremely important to manage your power, so you don’t experience any loss of power. 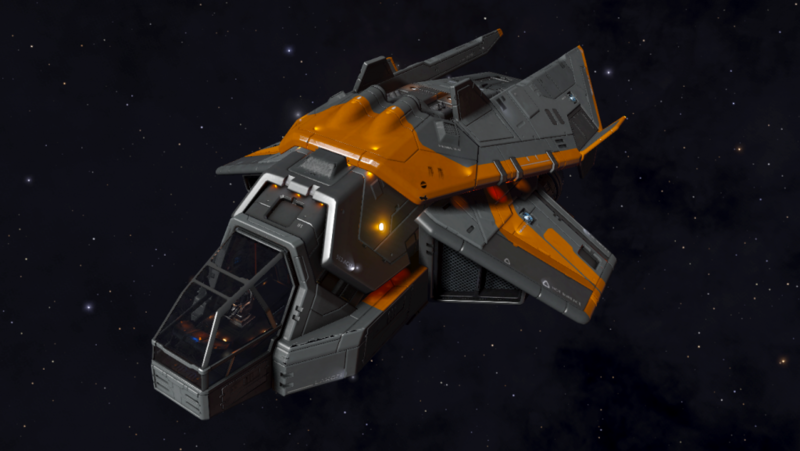 Fuel Scoop, Interdictor, Cargo if you are a fighter. If your weapons are not deployed, they do not draw energy: you can therefore exceed your maximum energy available! Priority 5 modules will then deactivate if you deploy your weapons. 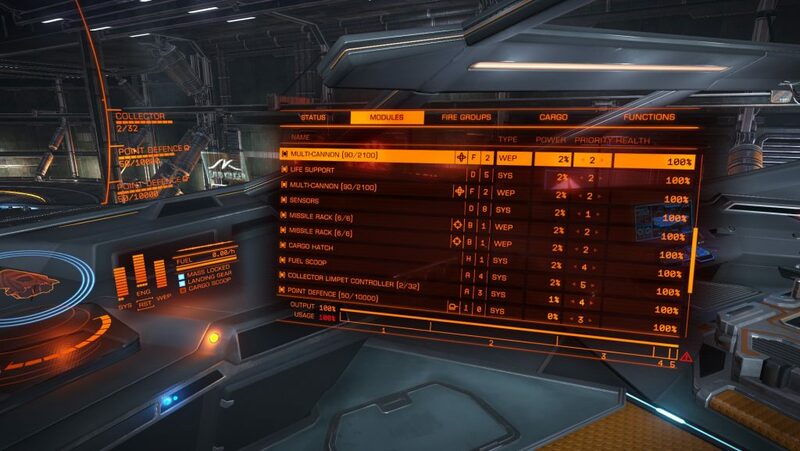 The different Scanners, FSD if you are very fast (>450 m/s), Drones Modules, Repair System, Shields/Boosters/Cells. If you have taken that much damage to the Power Plant, your shields might already be broken or even destroyed, so you do not need to supply them. Same goes to the boosters and cells. Chaffs, Heat Sinks, Anti-Missile Turrets, Fighter Hangar, a weapon requiring a lot of energy. 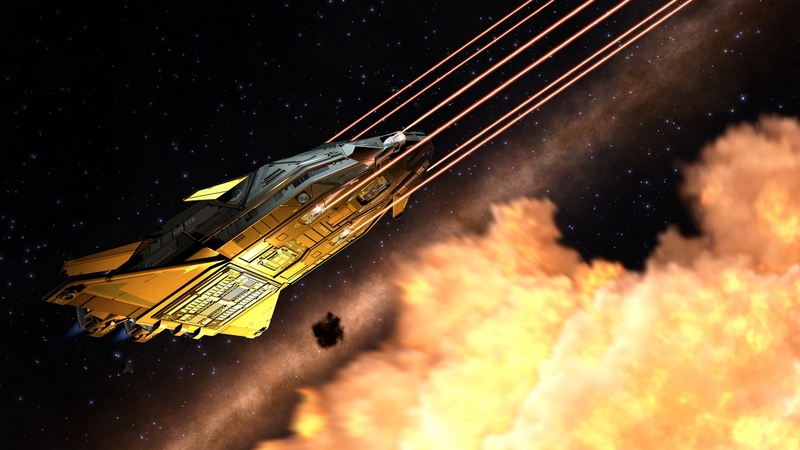 If you are at this point, you will probably already have used your Chaffs and Heat Sinks ammo: let’s disable them. A weapon like a Plasma Accelerator or a Beam Laser draws a lot of energy from your PP, it falls under priority 3. Some Weapons, Power Distributor, 1 Anti-Missile Turret and 1 Chaff if you have multiple. If you can get your Fighter Hangar in there, perfect! It is a big threat to your foes and are both defensive and offensive: your last chance to kill your enemies, if your hull still holds. Your Thrusters, Life Support, Sensors and FSD if it is not priority 4. 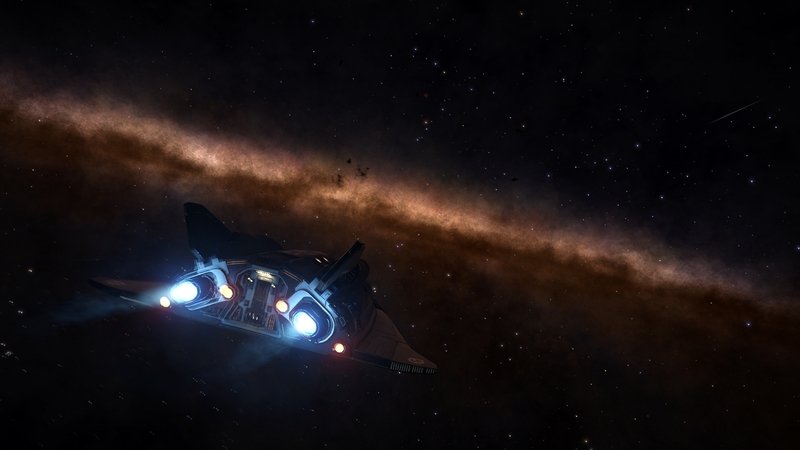 The FSD is essential here if you have a relatively slow ship (<300 m/s). It’s time to flee with your high speed or by jumping to another system. Depending on your amount of energy, put as many important modules below 50%. Pour vous mettre dans le bain, essayez de désactiver tous vos modules sauf les priorité 1. Vous devez normalement consommer la moitié de votre énergie maximum. Si oui, bravo, vous maîtrisez la gestion d’énergie de votre vaisseau ! Paufinez bien les priorités, que tout ne se désactive pas en même temps. 1) Target a subsystem when you attack. I see too many players targeting only the enemy ship. For maximum efficiency, aim for the default Power plant. 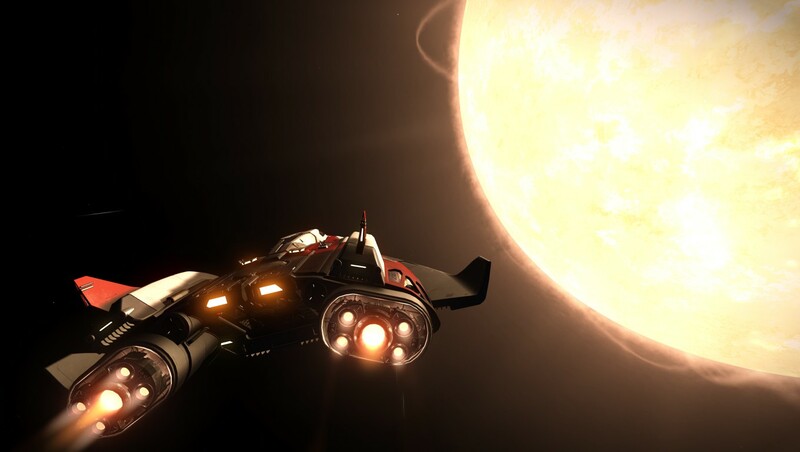 If you only want to stop your enemy, you are free to choose the thrusters or the FSD for example. 2) Do you have Gimballed Weapons and your opponent uses Chaff to hide its thermal signature? Stop targeting him. Your weapons will automatically become Fixed and you will be able to continue shooting at it before resuming targeting. Note that you will need to select the subsystem again. 3) Fed up with receiving missiles at your ship? Think about equipping Point Defenses and placing them to the right and left of your ship, or below and above. If you have a big ship, a Electronic countermeasures module also does the trick. 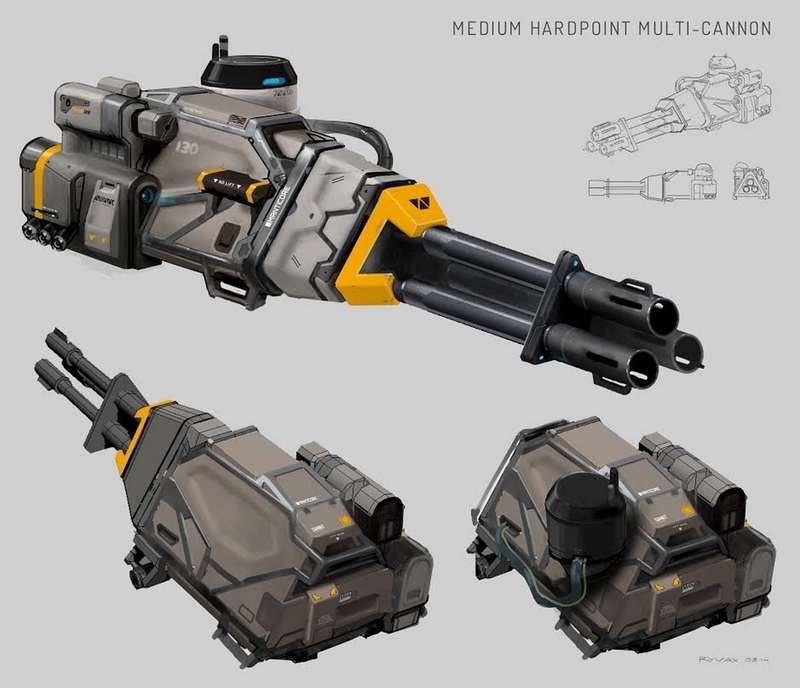 4) The current meta favours weapons quickly draining enemy shields (railgun and plasma) and modules bringing a huge amount of Mj to your shields. When you see a blue line going from front to back on the enemy ship, that means it recharges them! 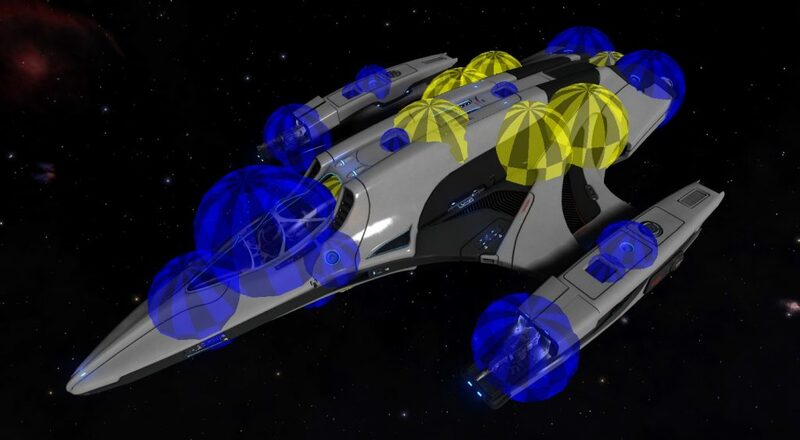 You can reduce the amount of recharged shields with a Railgun mod called Feedback Cascade. We’re starting to see a enw metal focusing directly your Power plant through your shields → Equip Modules Reinforcements and a module to repair the latter. → If you are the attacker do not exceed 75% of speed. You are looking for control. Once the enemy is interdicted, no more than 50% speed and NO boost! 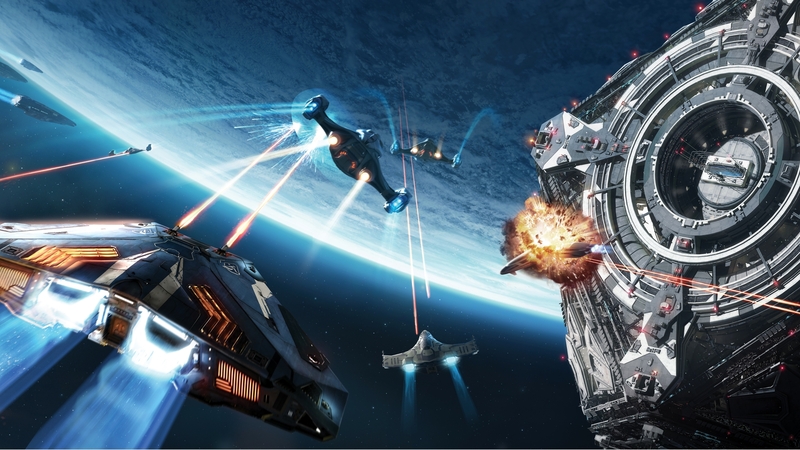 Search your enemy calmly with full points in the engines and shields. Once the enemy is engaged, go into attack mode and re-distribute your energy for that (engines and weapons). → If you are the defender, go for 100% speed. You seek to escape. If you do not want to fight, you can play the mini Interdiction game and get out of here, but if you feel you will not be able to counter the interdiction by playing the mini-game, cut your engines to 0; your FSD will recharge much faster than if you loose the mini-game. Then boost and fly away. If you want to engage the fight, cut your engines directly and once out of hyper-space, look for your enemy calmly with full points in the engines and shields. Once the enemy is engaged, go into attack mode and re-distribute your energy for that (engines and weapons). 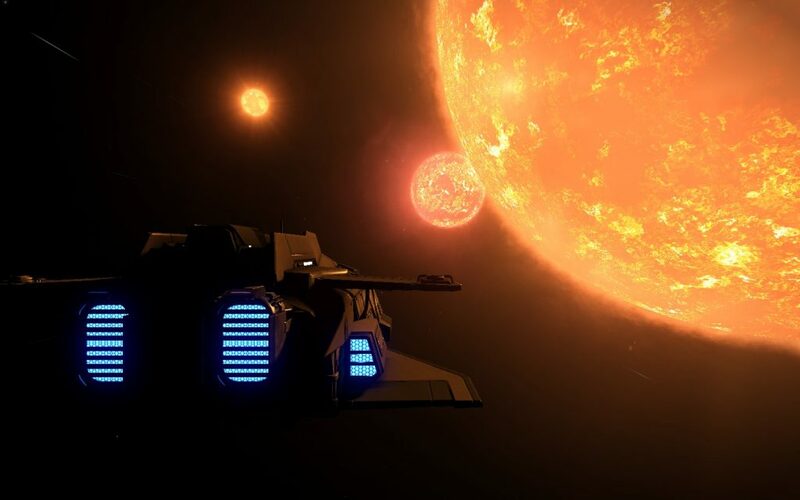 6) Always deactivate your cargo in the list of your modules to save energy and better dissipate heat; unless you are a pirate and have cargo items. 7) The weapons you will use continuously will most of the time have to be on the top of your ship; the “secondary” weapons below. Why ? Just because the weapons on the top will have more often a view of your enemy, while those underneath will cause you to lift even more the nose of your ship to shoot. 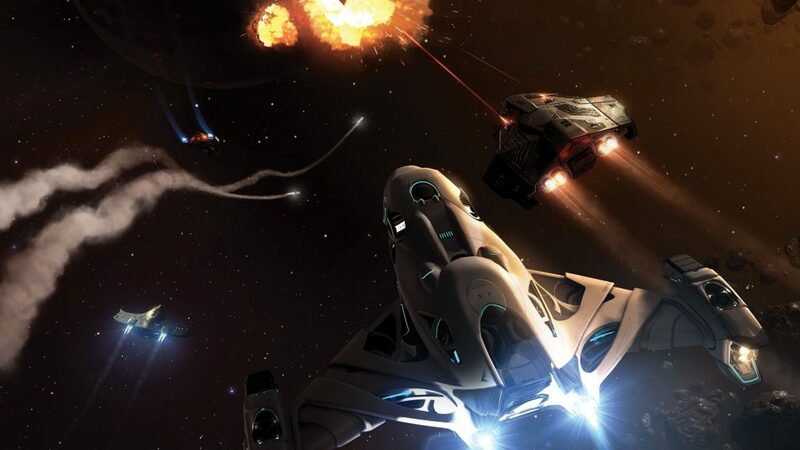 The very agile ships such as the Viper or the Eagle have however their best weapons below, it’s their gameplay as they can quickly face the enemy and move as they see fit. 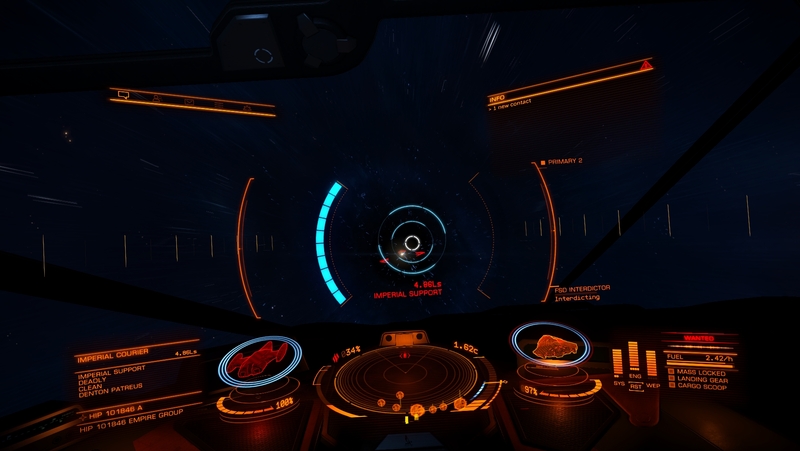 8) When you scan ships with scanners (cargo, bounty, …), and suddenly your target comes out of your field of view, hold the scan! Thus it will slowly decrease until your target returns to the line of sight. If you let go of the scan, it will go back to zero. 9) Learn how to manage your SYS ENG WEP energy. This represents the amount of energy you allocate to your Systems (shields strength, shields speed recharge, systems, …), your Thrusters (speed, thrust, boost, …) and your Weapons to shoot during a longer time. There is no point in putting all the points in the bars each time. You need to know the needs of your ship. On 6 available points, I use for example a 4ENG + 2WEP on my Stealthed Diamondback Scout, a 3ENG + 3WEP on my Python or a 3SYS + 1ENG + 2WEP on my tank ship. All of these configuration change depending on if I’m under fire, if I need more speed or shields strength. Basically, if you’re fired at, your should always have 4SYS. 10) Remember that the blue zone of your speed is the area where maneuverability is the best. It manages your speed forward AND backward as well. 11) Pirates, are you looking for a black market close to you? Enter your current system and Spytec will indicate your destination. 12) You can repair your cockpit / canopy with a repair module. Any comments or tips on this fighter’s guide? Do not hesitate to share them with us. Thanks to the players who provided us with some pictures of their ships!